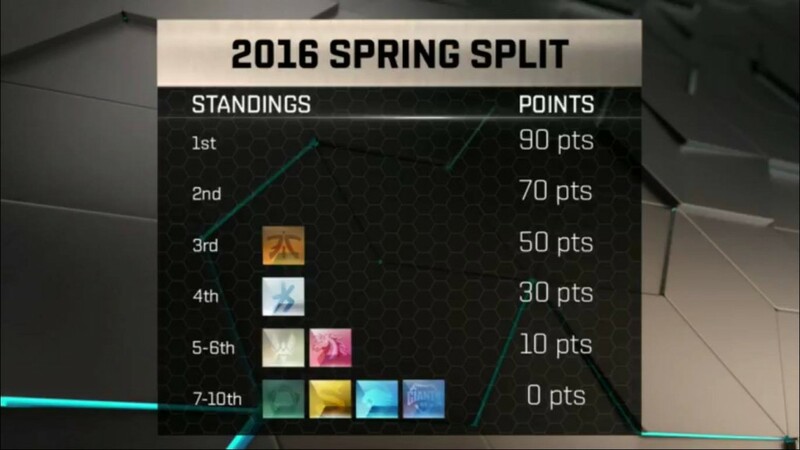 It’s time to decide who will earn the 3rd place spot in Europe’s League of Legends Spring Split. 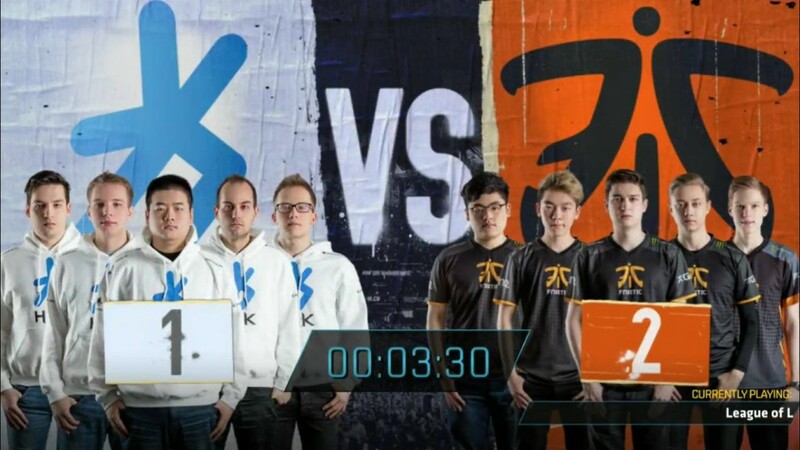 H2K faces Fnatic in a matchup that few would have predicted to take place on Saturday at the start of the season. 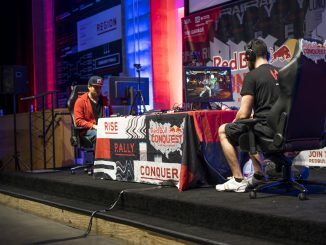 The competition is going down at the Rotterdam Ahoy in the Netherlands. The winner will secure valuable Championship points for a chance to get into the World Championships in September. 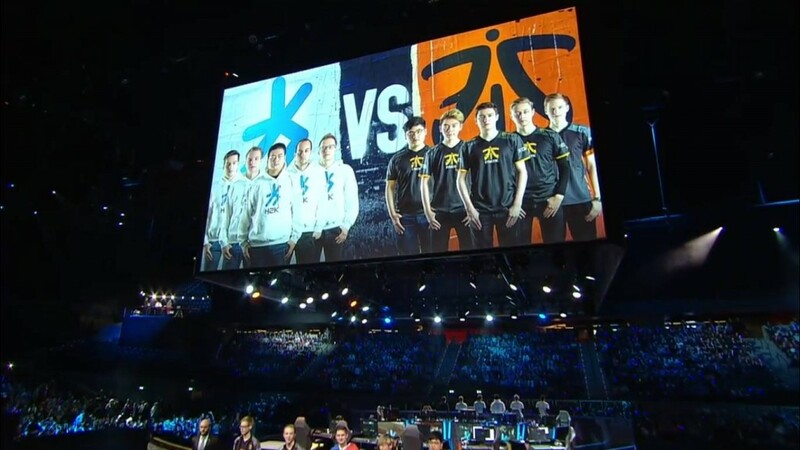 Fnatic has long been a finals fixture in the LCS scene, but the team was shocked by a calm and collected G2 Esports team last weekend, and they dropped the match 1-3. H2K had a closer match with Origen, but they couldn’t close it out for the win, falling 2-3 to end up in this 3rd place competition. I’ll be with you throughout the match providing live updates. You can join in the discussion by tweeting with the hashtag #ESSLCS during the match. I’ll post some of the more insightful observations and the freshest memes here in the live blog. 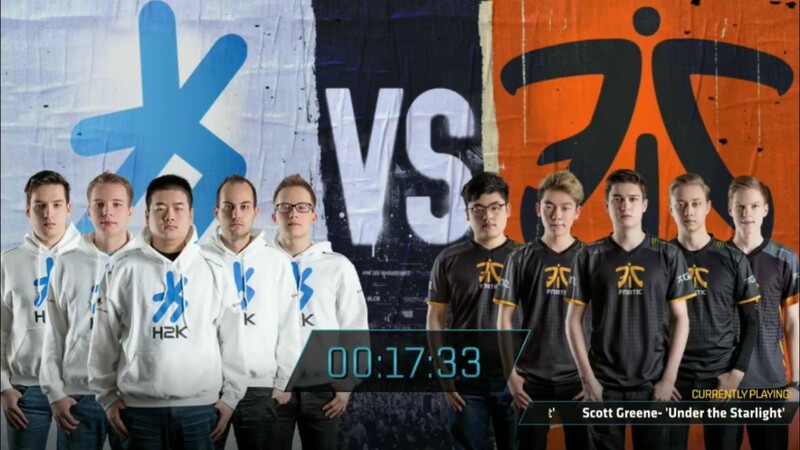 Hello and welcome to live text coverage of the 3rd place match between H2K and Fnatic! Just 10 minutes to go before we’re joined by your hosts Quickshot, Pulse and James ‘Stress’ O’Leary in Rotterdam! 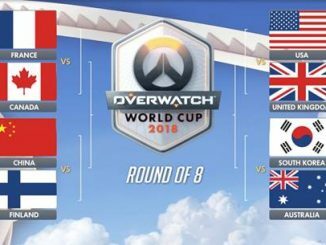 Who do you think will take 3rd place? Use the esslcs to get involved on twitter. The stadium in which the match will take place today. 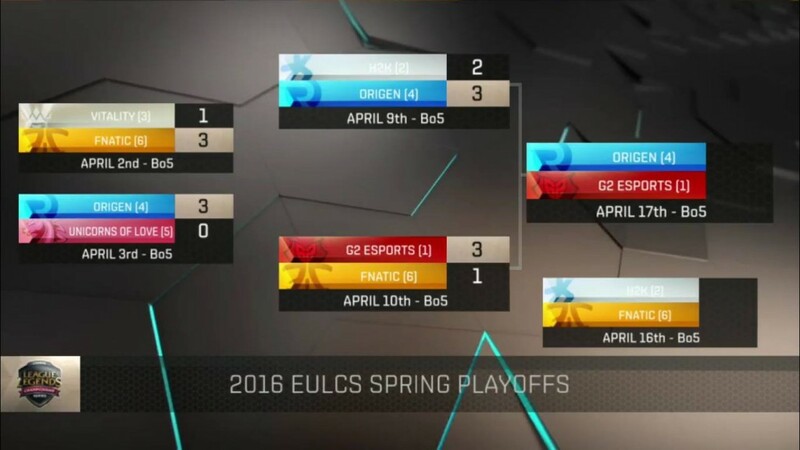 How the playoff bracket has played out this Spring Split. 20 points is the difference between winning and losing this game. 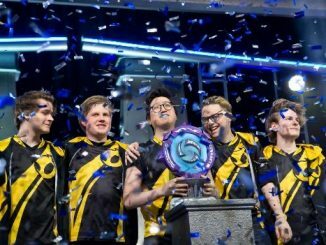 Those Championship points could be crucial at the end of the Summer Split in getting to the World Championship. 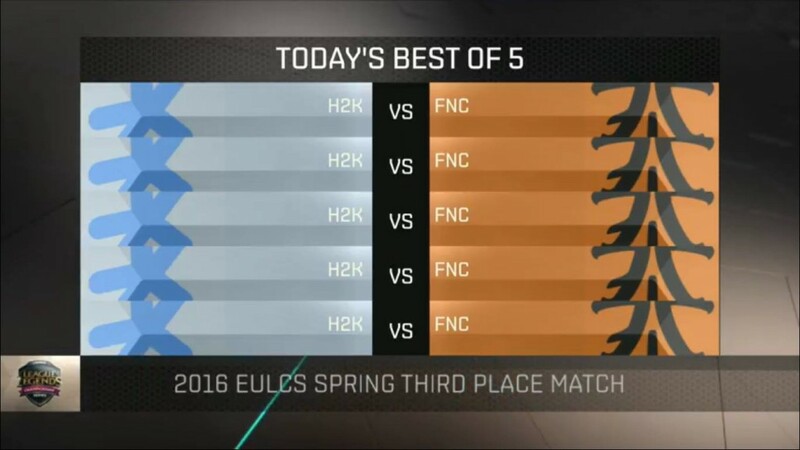 H2K will be blue side throughout this series, FNC will be red side. 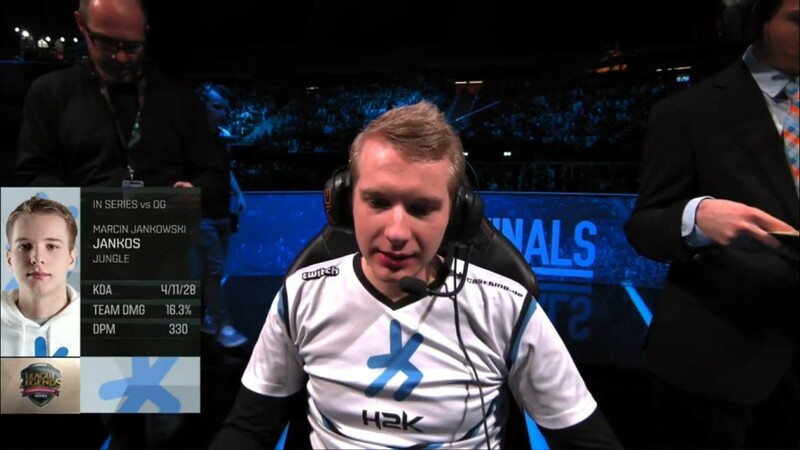 Jankos didn’t put in a good performance in the Semi-Final against Origen. The H2K jungler will have an advantage this time around, with his team being able to first pick a jungler in all 5 games. It does give Fnatic chance to counter pick though. 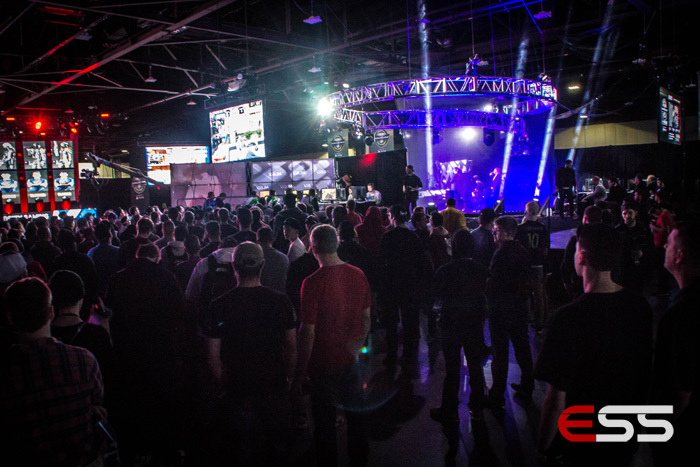 Picks and Bans are underway! 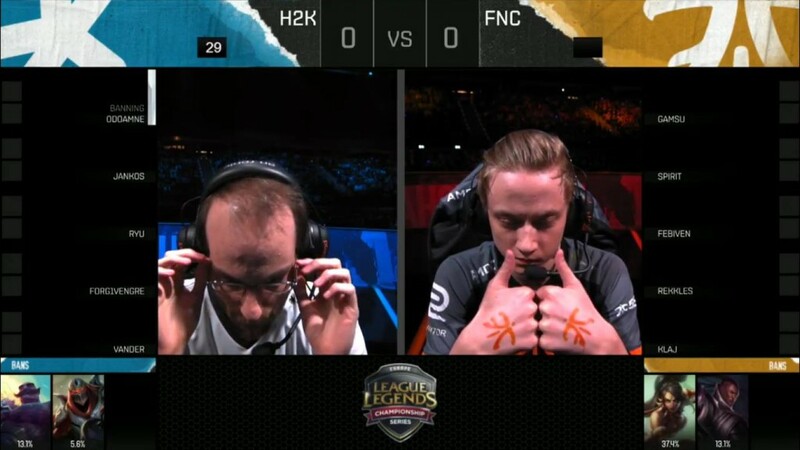 Rekkles sporting the Fnatic hand art. 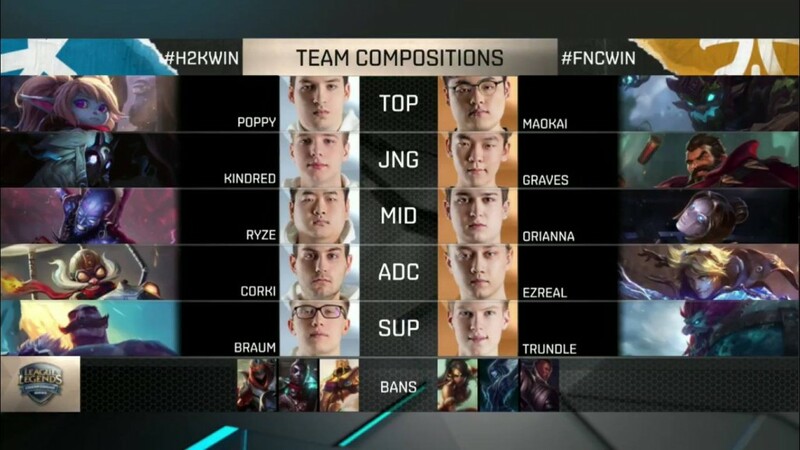 Game 1 Picks and Bans are in! 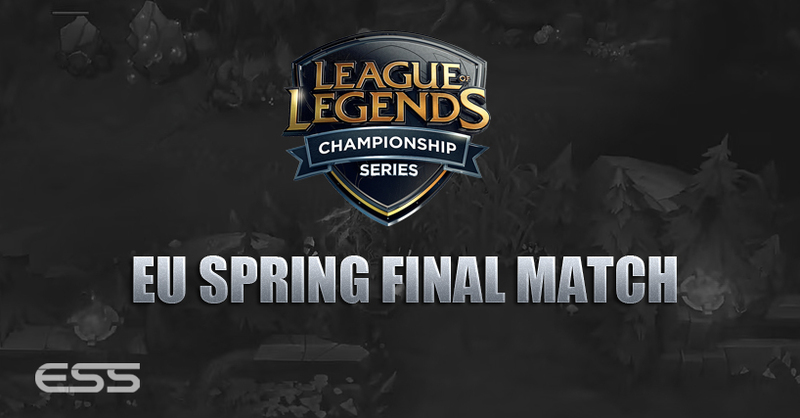 Sivir, who was 100% picked or banned during the playoffs, somehow escapes each teams grasps. 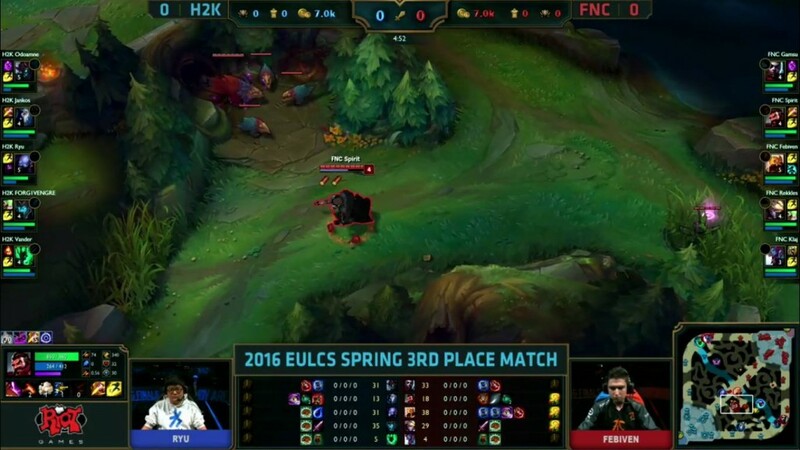 Keen to note that H2K have double teleport – Fnatic’s Febiven has instead gone cleanse. Quick update, nothing has happened yet. 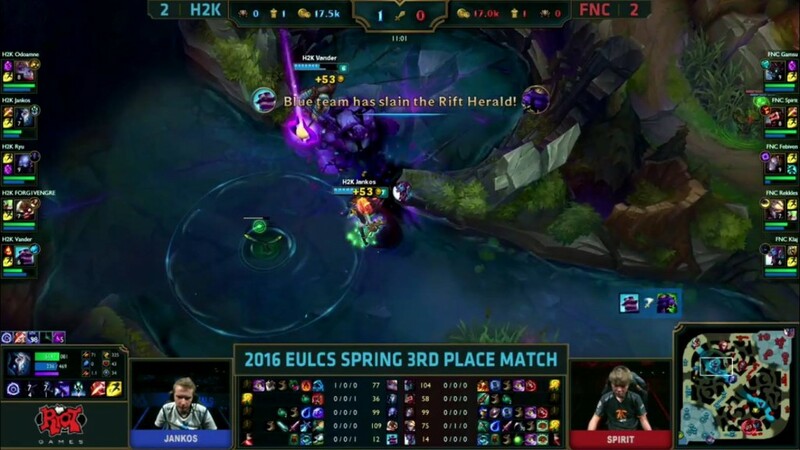 Slight CS lead for H2K’s bot lane duo who have the more aggressive matchup. 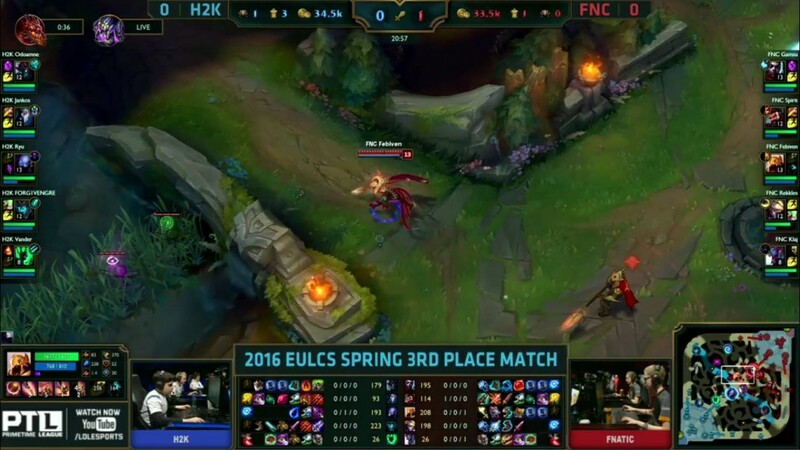 H2K’s duo really punishing FNC here, CS lead is going to just get bigger and bigger. Klaj going low. 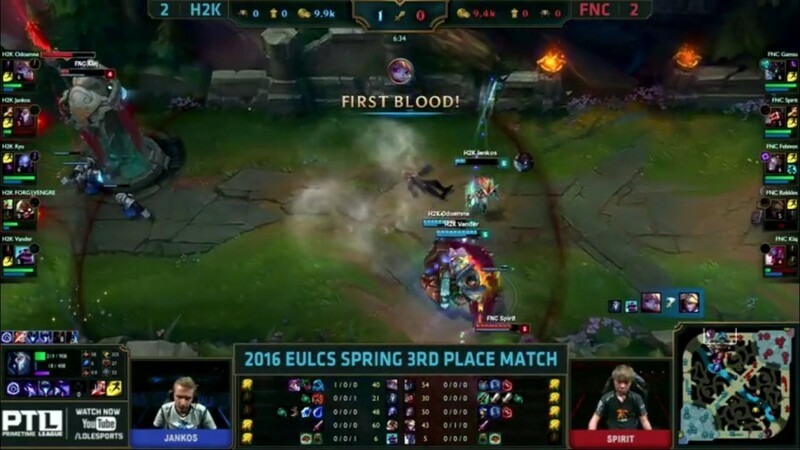 First blood for Fnatic! 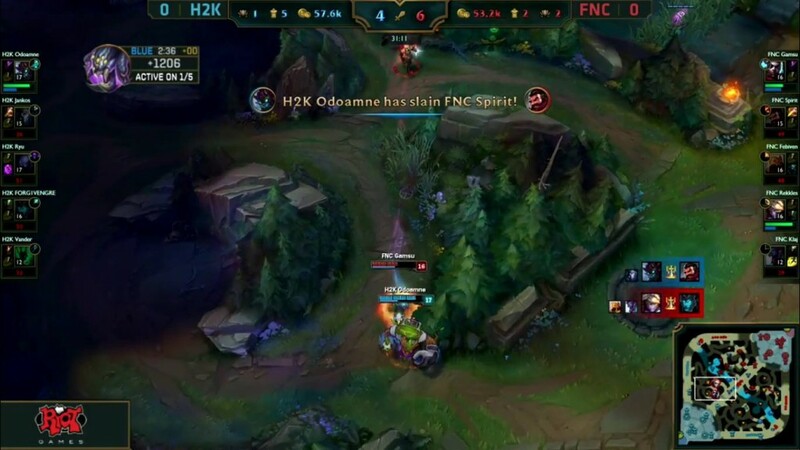 Febiven ults Ryu into Spirit and Klaj who are able to chunk out the Ryze. 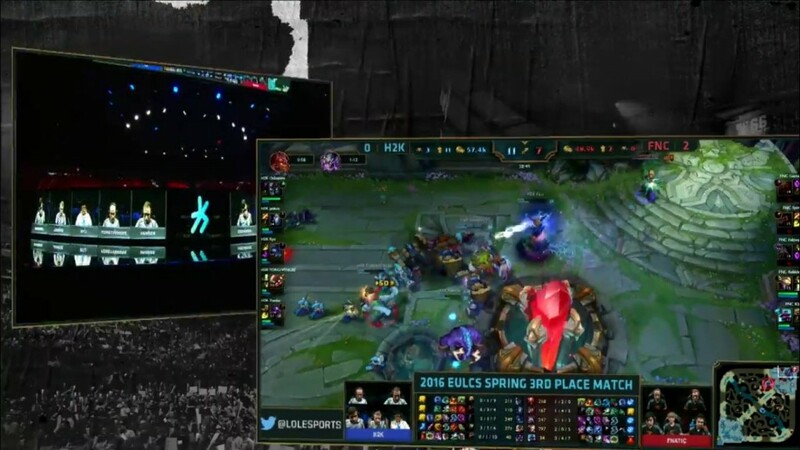 12-minute update as H2K grab the first Rift Herald of the game. 0.4K gold advantage for the side down 1 kill. Ryze’s damage on Azir is insane, I don’t think even Ryu was expecting it! Febiven taken really low, cleanse was burned. H2K are dominating in the mid-game and apart from the early first-blood from Fnatic, they’ve been perfect in their macro play. 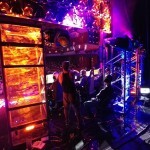 Dominating in towers at the moment and Fnatic are playing reactionary. 21 minutes gone – Baron and Dragon are gonna be contested soon. Vander caught in no mans land. Jankos responds with a kill onto Rekkles in the top lane for H2K. 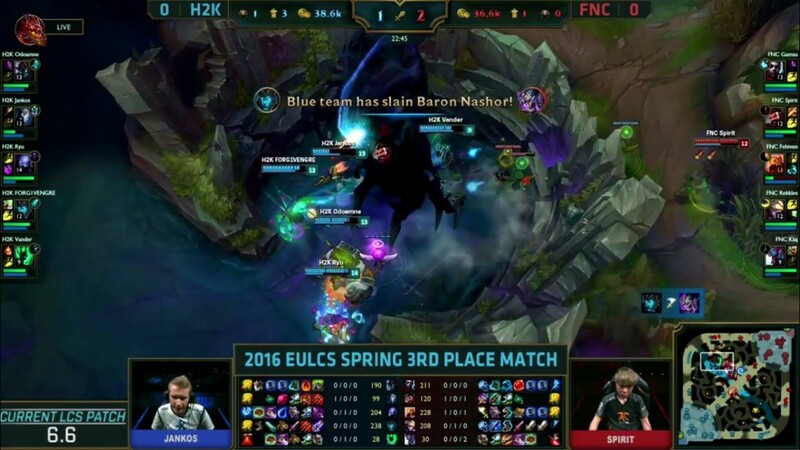 H2K take Baron! They take it so quick with the power of Kindred and Kalista and Fnatic can’t respond. 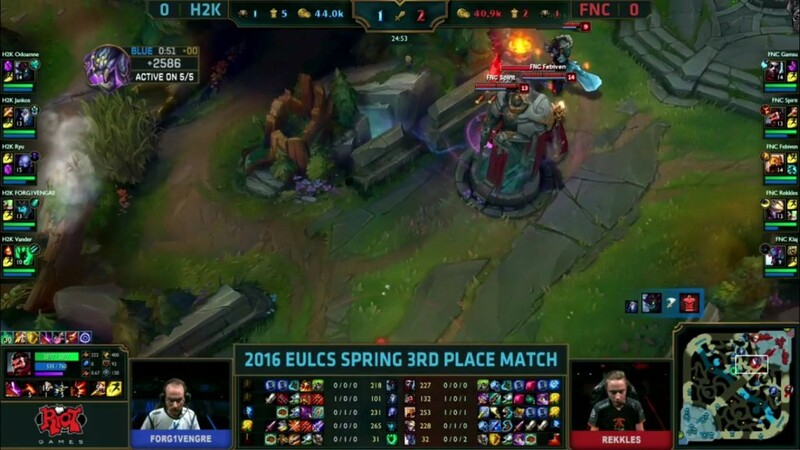 H2K get their 5th tower of the game. 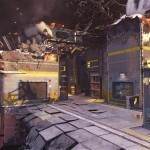 Objectives coming up soon, hopefully that’ll see the start of fights throughout the map! 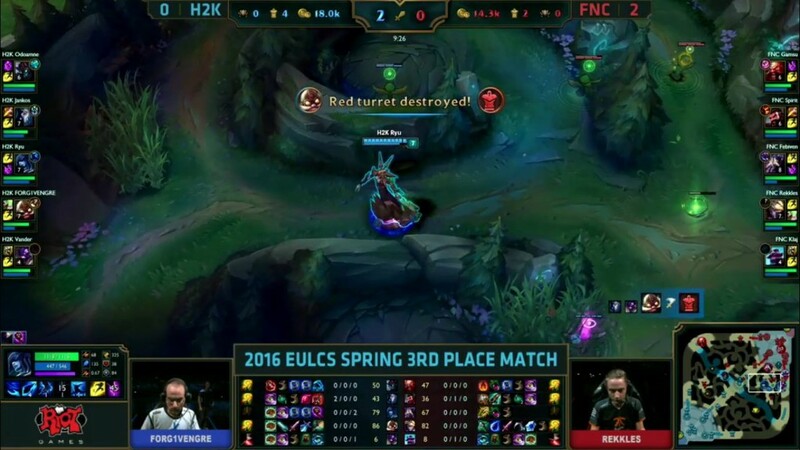 Fnatic take Baron, but H2K’s Ryze has teleport and is able to push out the top side lane to the inhib. 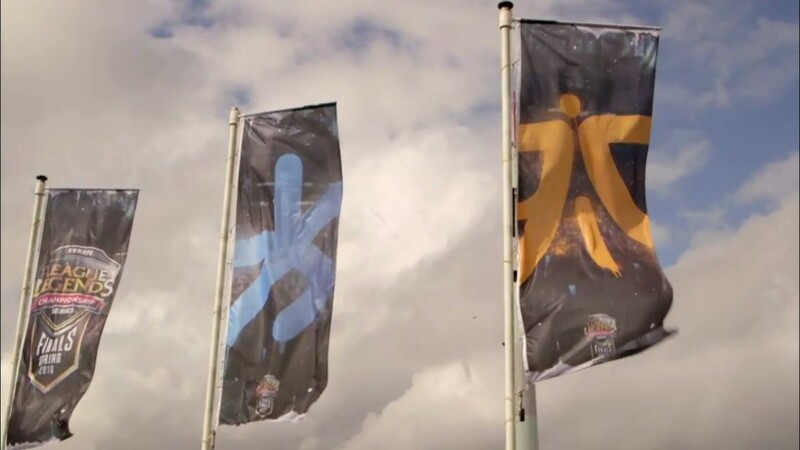 …but Fnatic are able to take out 4 members for the price of 3! Rekkles goes untouched throughout that whole team fight and is able to deal tons of damage! 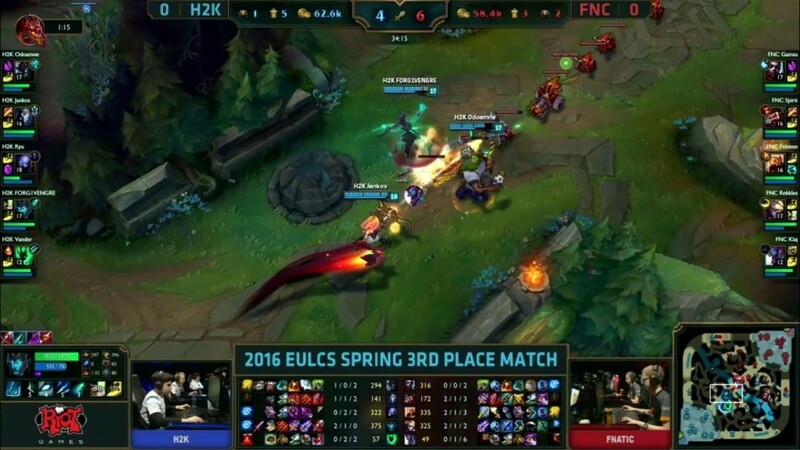 They’re still down in gold, but that halts any H2K pressure and momentum. 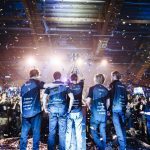 Despite being down 4K in gold, Fnatic want to team fight. 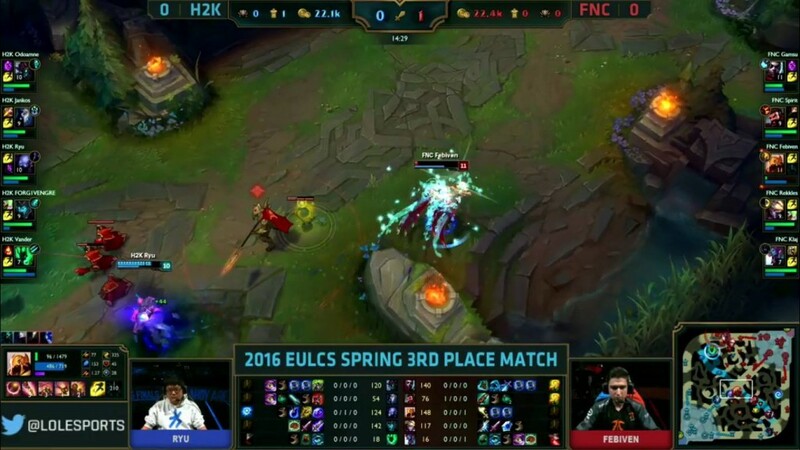 H2K have immense map pressure with banner of command on a minion and the split push potential with double teleports. When grouped, Fnatic’s Azir and Ezreal are being able to poke H2K down, even the tank, Maokai. 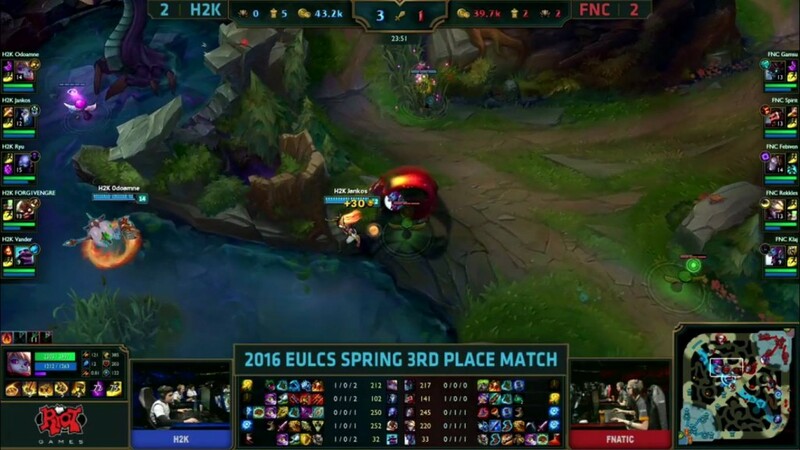 H2K’s Maokai teleports behind Fnatic, but Fnatic stand strong! 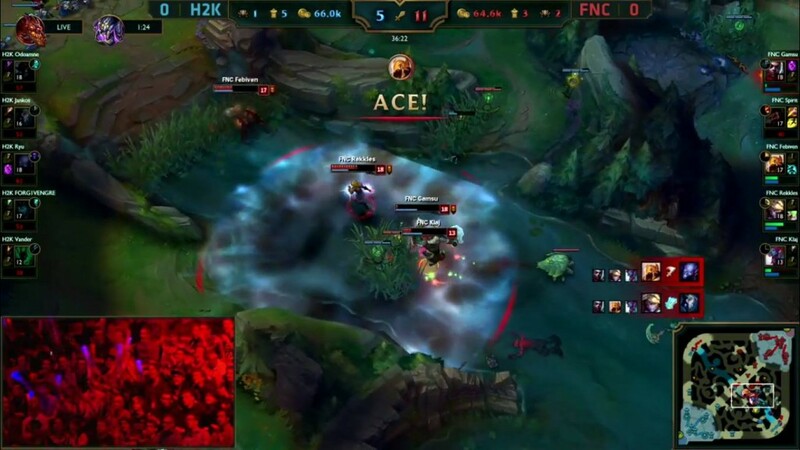 The teleport onto the backline is a good idea by H2K, but they’re fighting in a narrow corridor which is a huge advantage for Fnatic and Febiven on Azir! 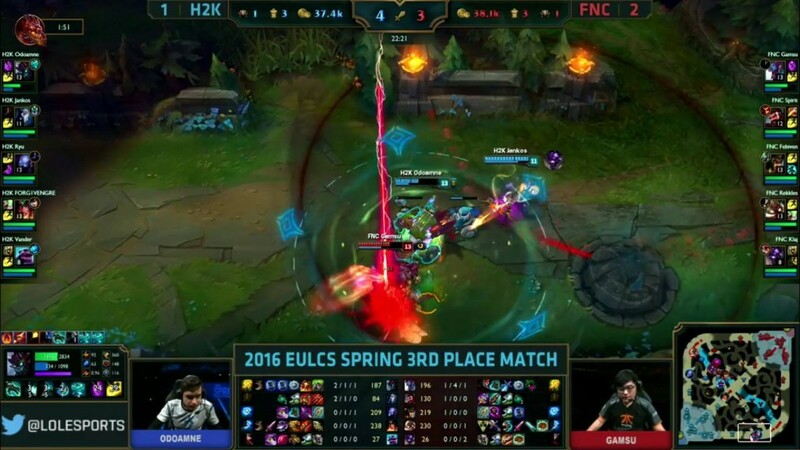 H2K collapse in team fighting, yet again and they lose the game off it! 1-0 Fnatic. 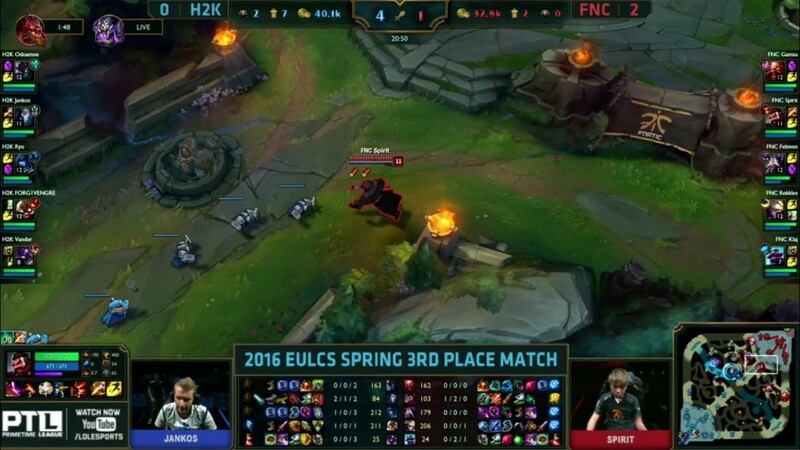 H2K’s Maokai teleports behind Fnatic, but Fnatic stand strong! 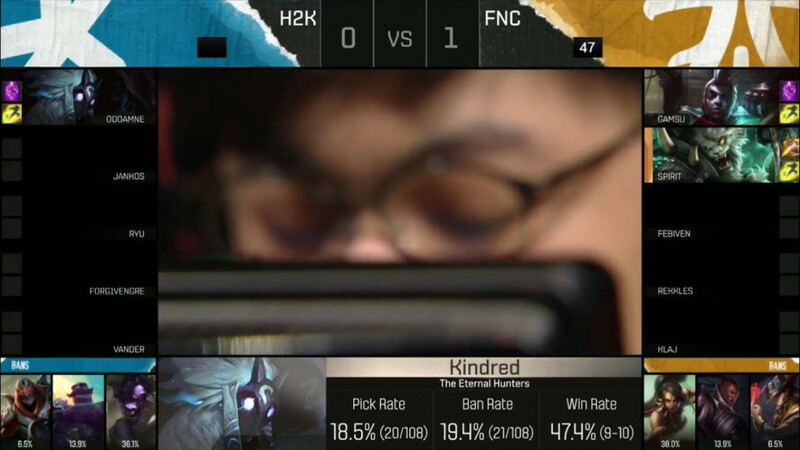 The teleport onto the backline is a good idea by H2K, but they’re fighting in a narrow corridor which is a huge advantage for Fnatic and Febiven on Azir! 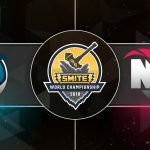 H2K collapse in team fighting yet again and they lose the game off it! 1-0 Fnatic. 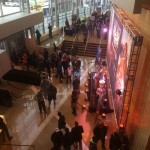 Pick and Bans underway. H2K pick up the Kindred again for Jankos. 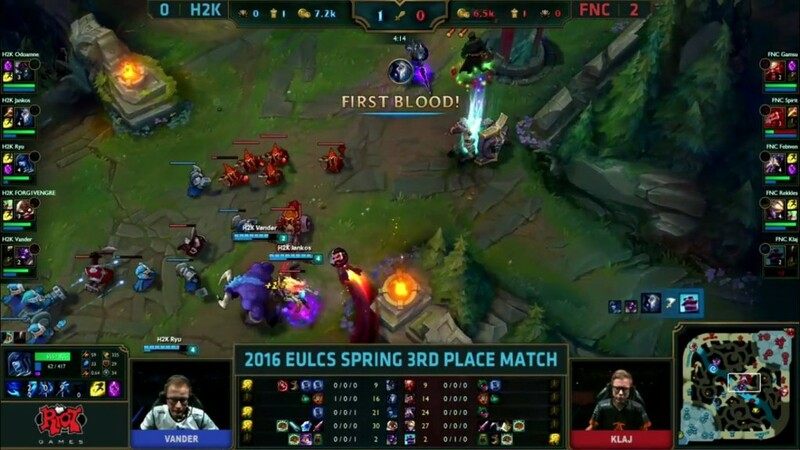 In fairness to H2K, apart from first blood, their early game was immaculate – and Jankos did play really well on Kindred. The problem was that their team fighting is, and was in the semi-final too, so lacklustre. Remake! Game 2’s Pick and Bans are the exact same as Game 1. 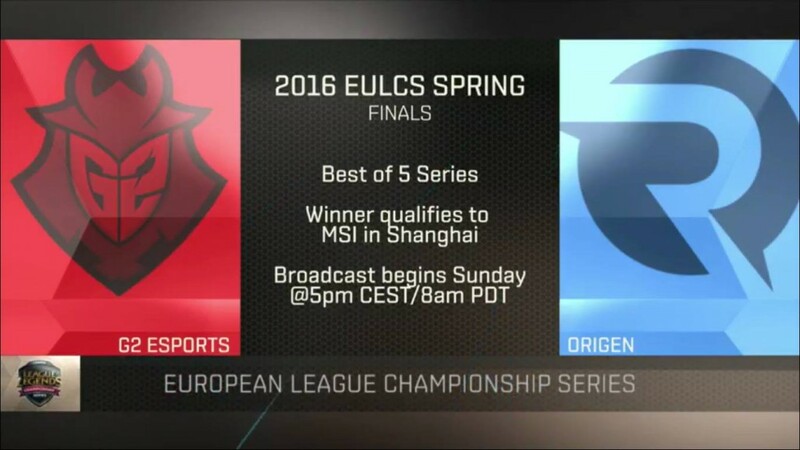 H2K will be looking to transition their early game dominance into a win this time around. Keystone Masteries for each team. 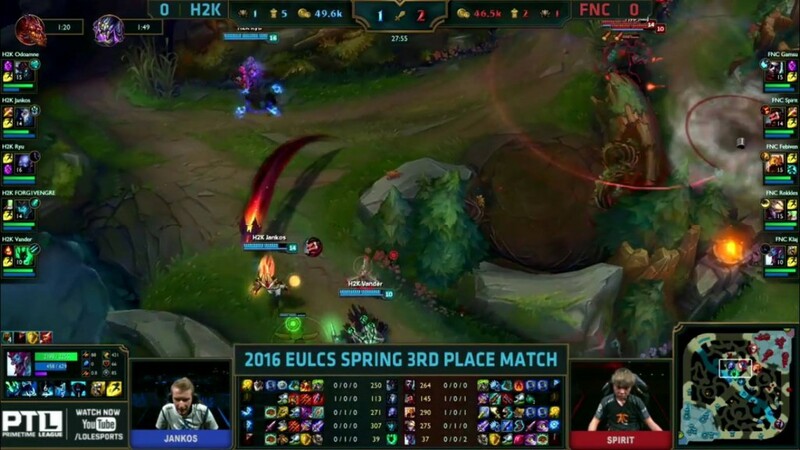 Key to note that in this game FNC manage to lane swap their duo that was getting overrun last game. H2K take the tower quicker and are able to rotate down towards Rift Herald. 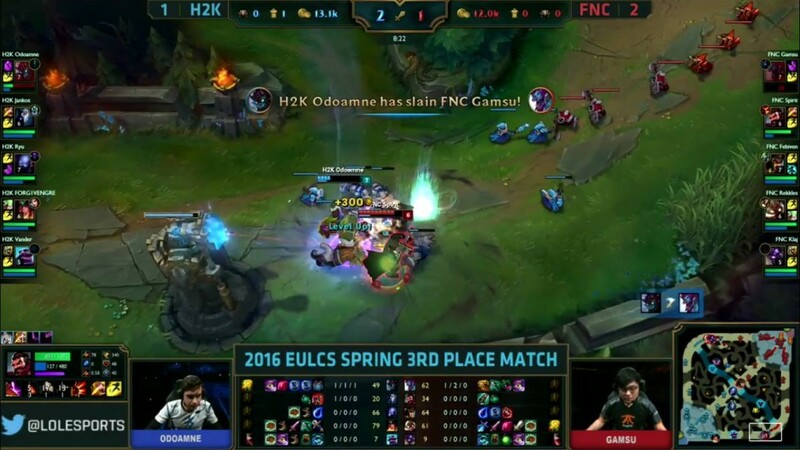 Another good start by H2K, Gamsu down on CS to the Maokai now on Ekko. 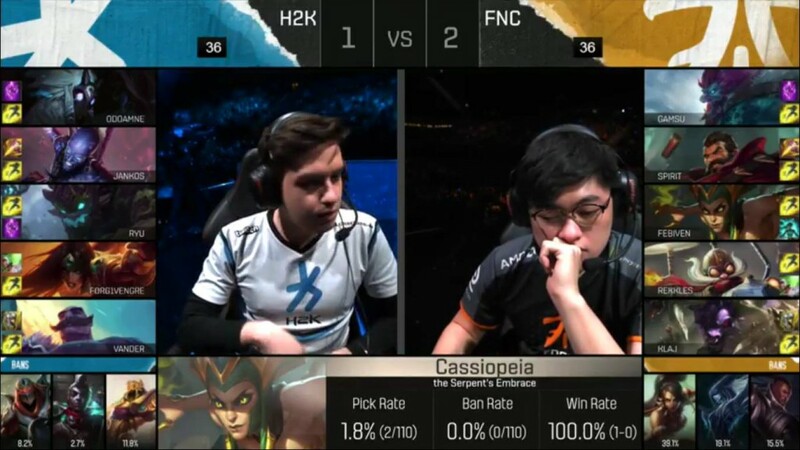 Same picks, same bans, same scenario for first blood! 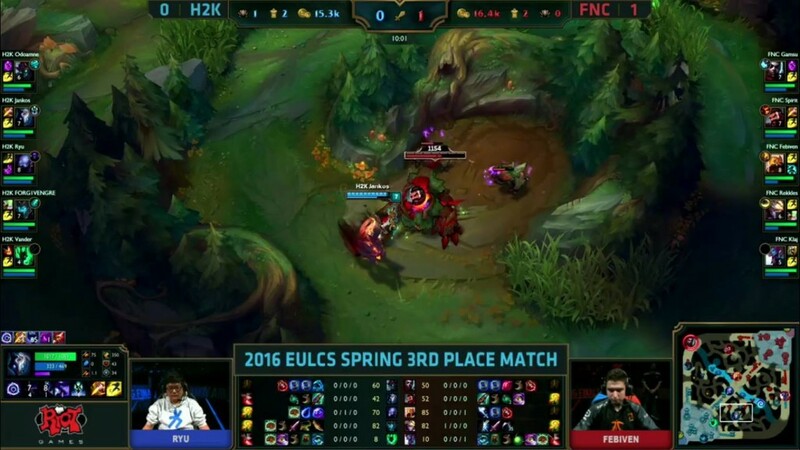 Febiven is able to ult Ryu into his bot lane duo. 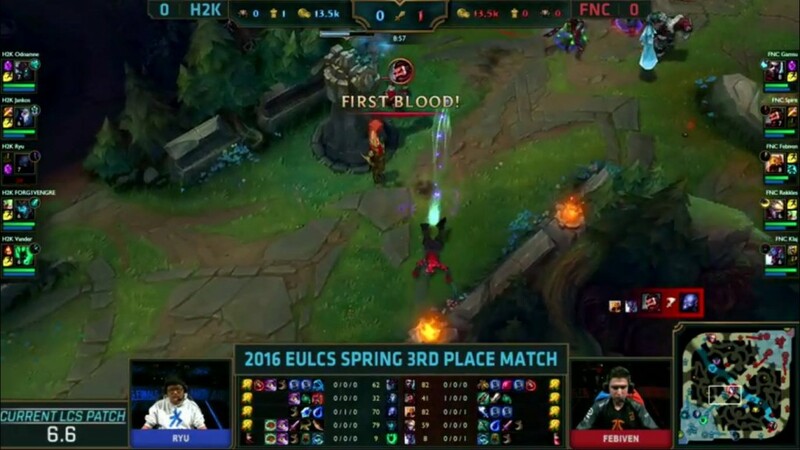 Rekkles is able to pick up the first blood. 10-minute update. H2K down 1.1K Gold. 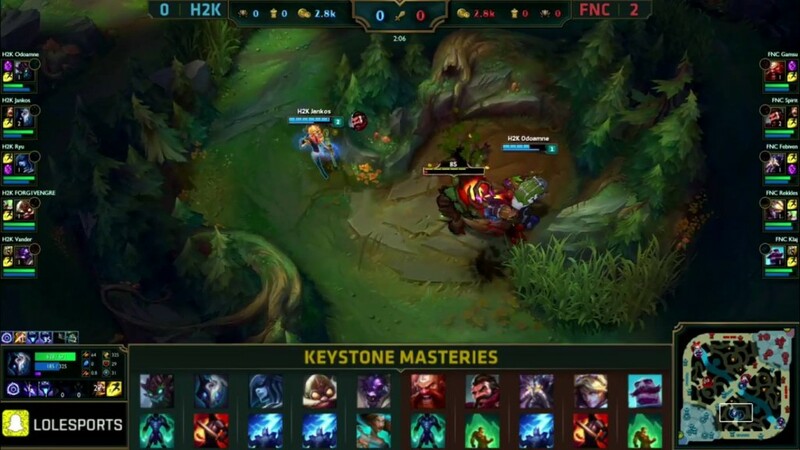 They need to start making use of their double TP before it’s too late – the early game pressure has not been as good as it was last game by H2K – mainly because of Fnatic managing to get a lane swap. 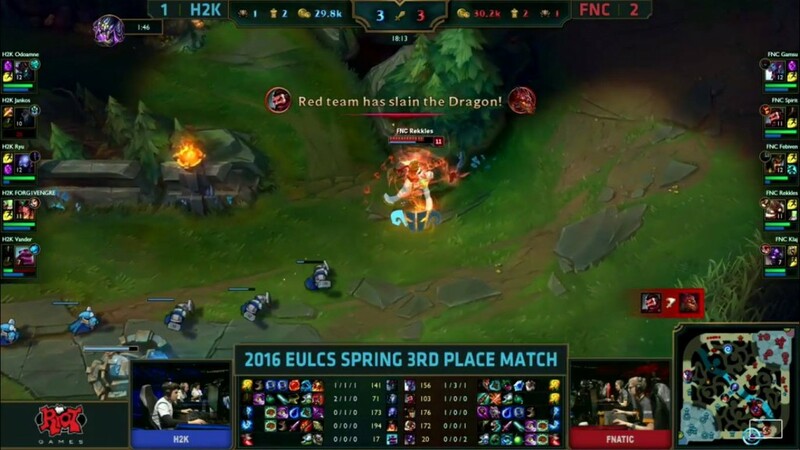 H2K are able to pick up their second dragon of the game uncontested. 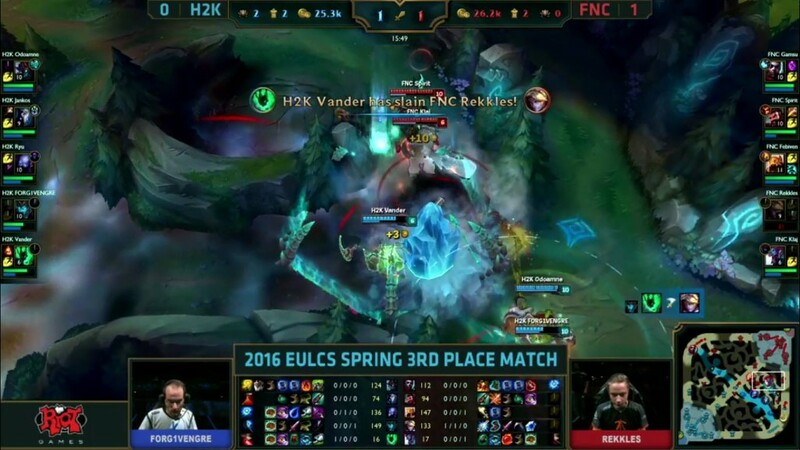 Vander is able to catch out Rekkles in Fnatics blue side jungle. The rest of the team collapses around Vander and he’s able to pick up the kill. 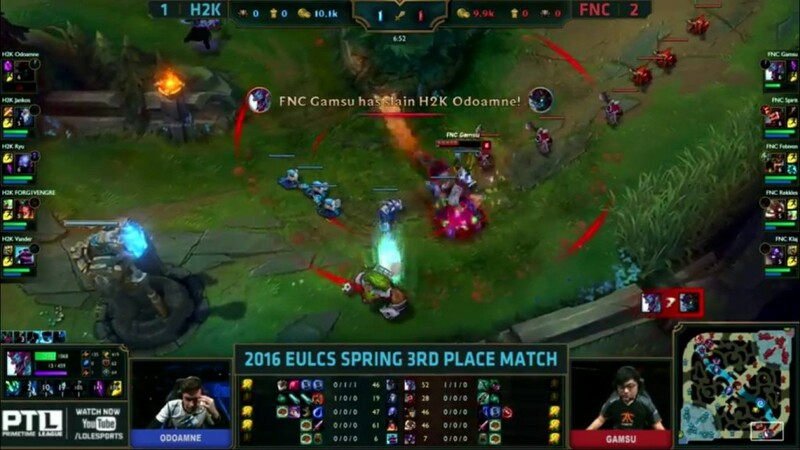 Gamsu is able to push top in the mean time and H2K have to react, backing and rotating to defend their turret. Jankos is able to grab rift Herald, but H2K lose 2 members in the process! Scrappy. 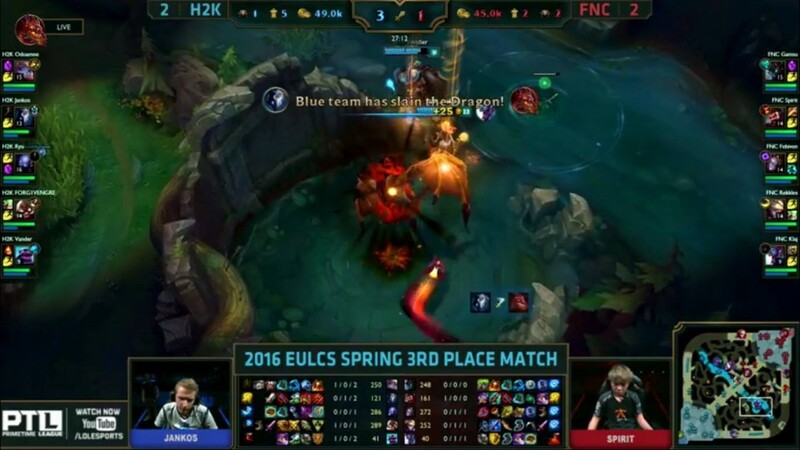 H2K look to have timed dragon perfectly, but Spirit steals it! They rotate to mid and are able to pick out Forgiven as they bait Baron. 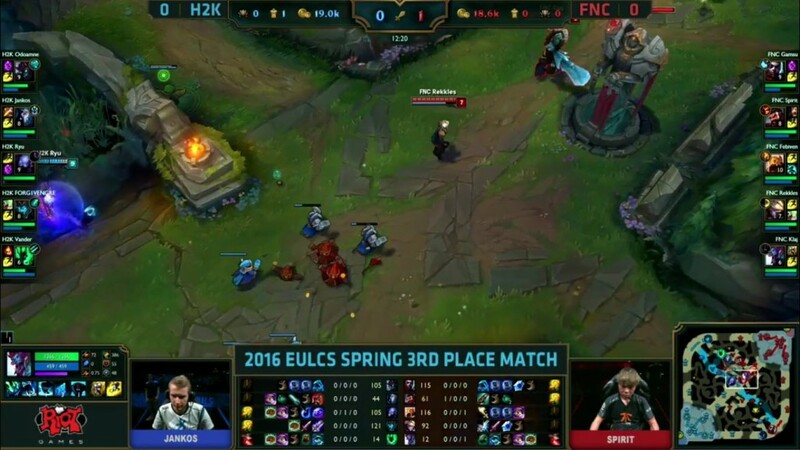 H2K are desperate, they are on tilt here! 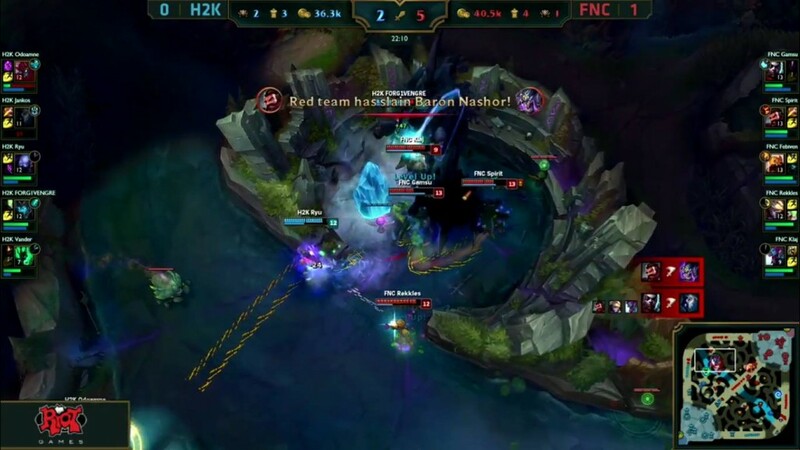 They try to rush down Baron but Fnatic collapses and are able to pick off members of H2K and steal the Baron for themselves! Huge. 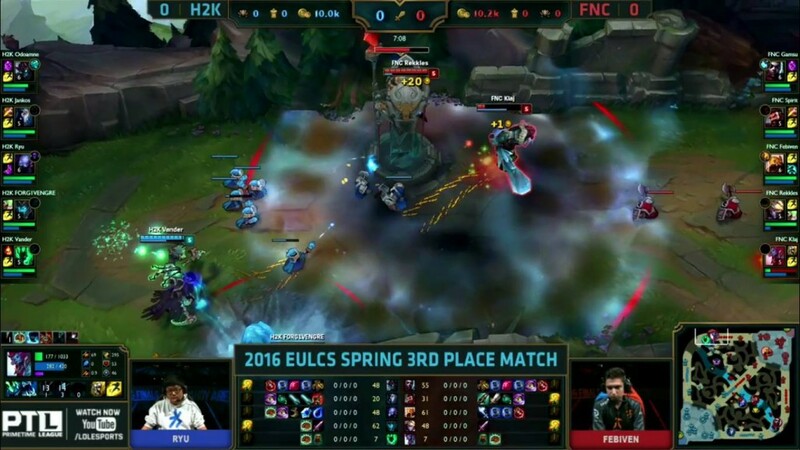 H2K’s team fighting is terrible. 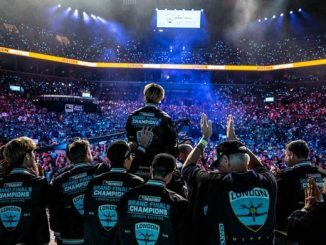 H2K have to do something. They engage onto Spirit, but it ends up in them being aced and Fnatic winning Game 2! What a convincing victory. They are now just ONE game away from winning the series and taking 3rd place. 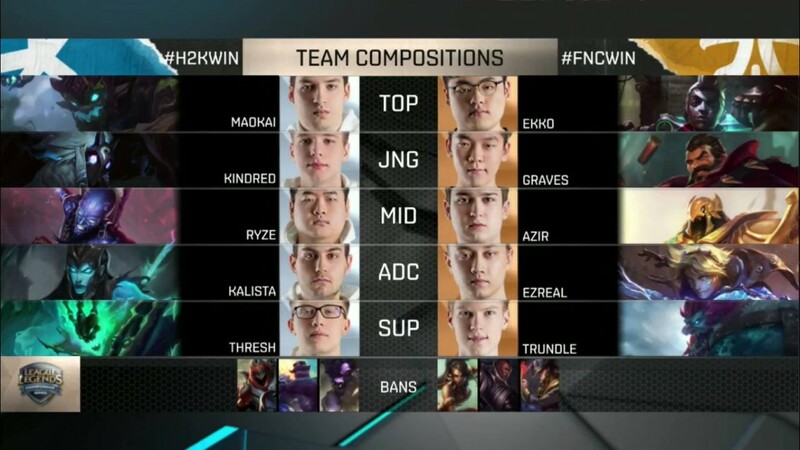 Game 3 is coming up shortly and H2K really have to find a way to sort out their team fighting problems. 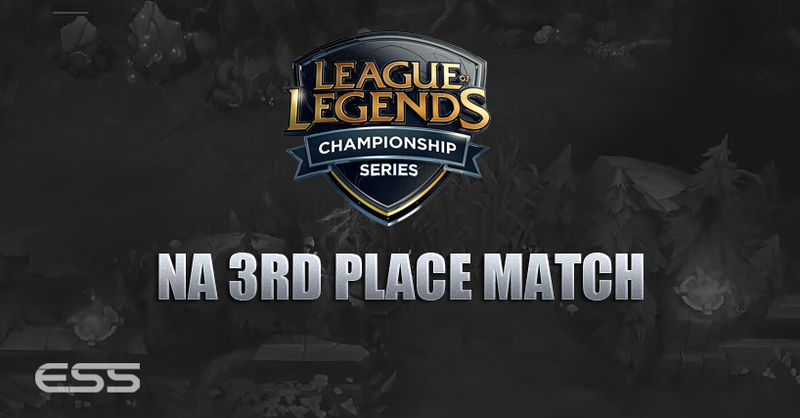 Fnatic are one win away from taking 3rd place. 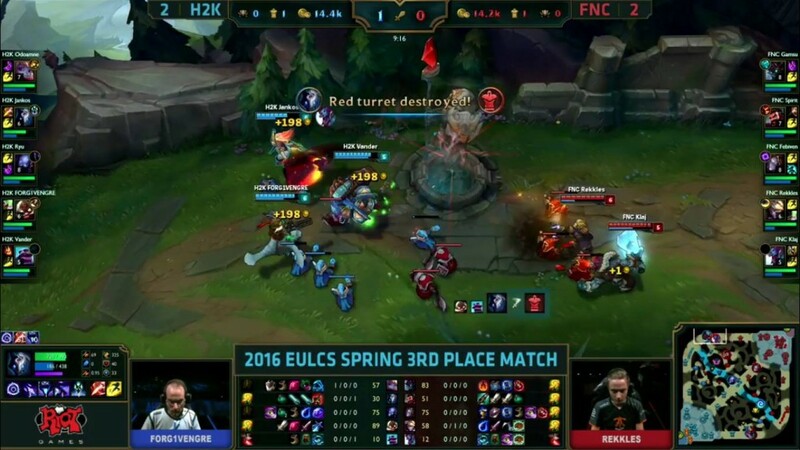 Everytime H2K make a mistake, they seem to tilt. 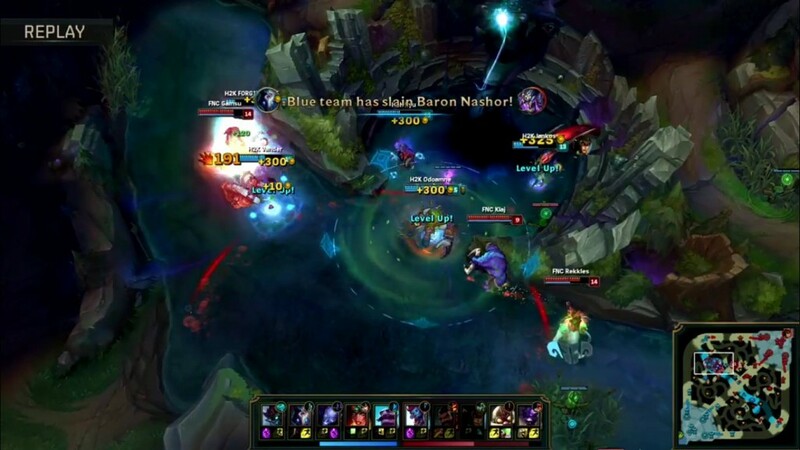 In that last game, they gave away Dragon and went on to lose Baron and the game in less than 10 minutes. They need to keep their composure and play to their wind conditions. We will have different picks this time! 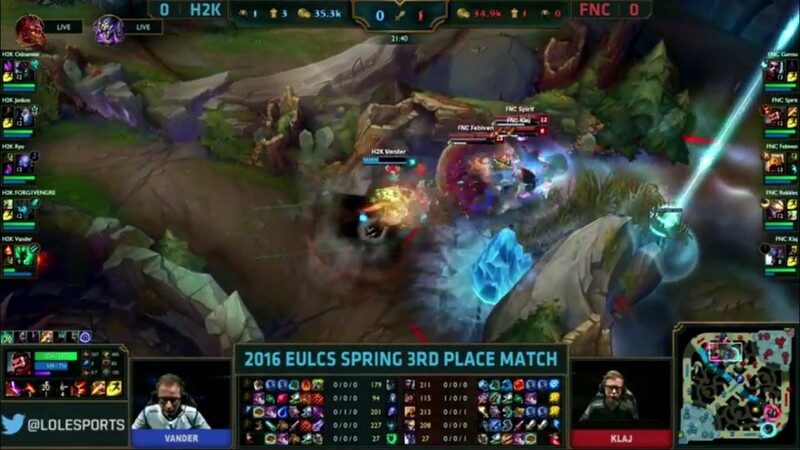 H2K decide to ban out the Ekko and Azir that has been troubling them the last 2 games. 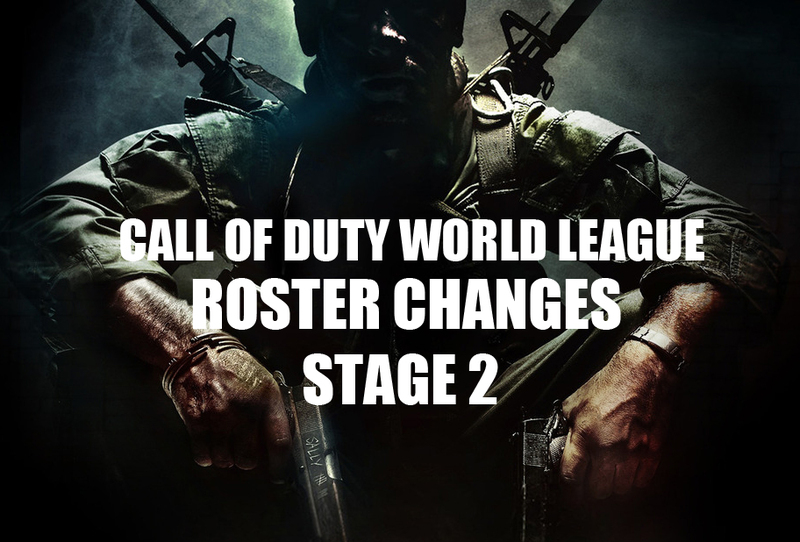 Complete Pick and Ban phase to come shortly. Here we go, the final chance for H2K. 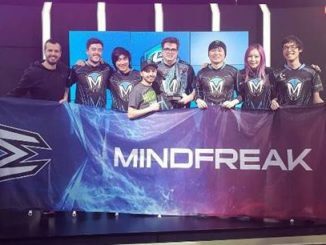 They have a good team fighting comp with the likes of Maokai and Lissandra and have much better wave clear than Fnatic, I favour them here. Keystone Masteries for both team. Turrets traded because of lane swaps. 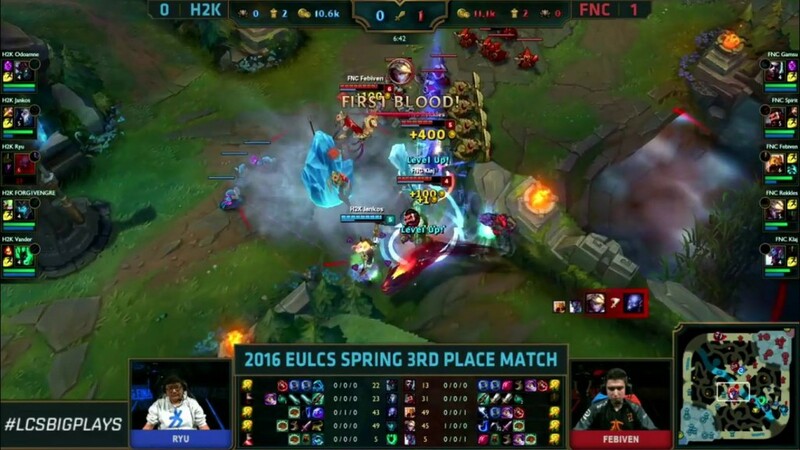 H2K secure first blood for the first time in this series! 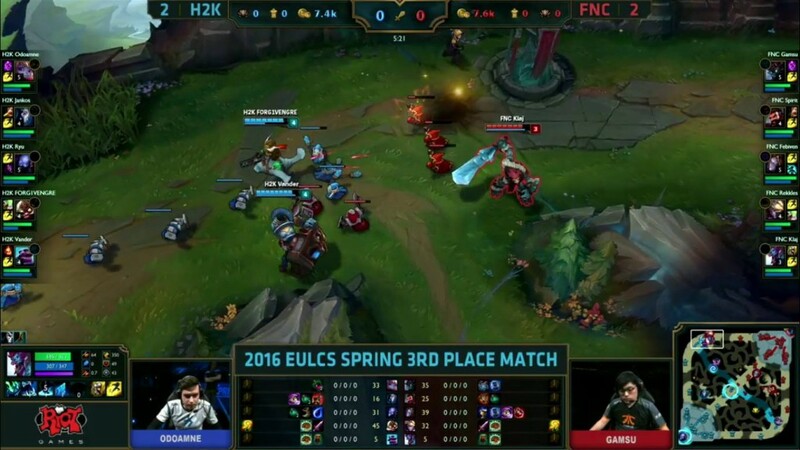 H2K have started really strong here in Game 3! They execute a clean tower dive onto Spirit in the mid lane to give themselves a 2K gold advantage. 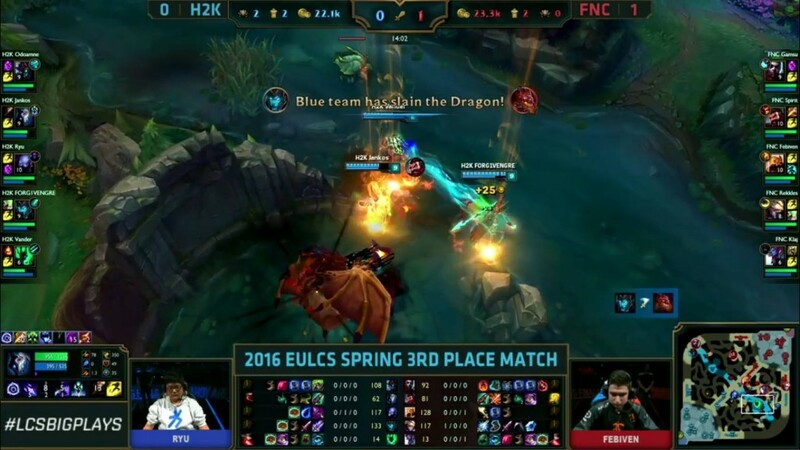 H2K take a turret and take dragon. At 9-minutes, they are now 4k+ gold up. Beautiful start by the team that is showing no signs of fear in this game. H2K are showing up big time here. 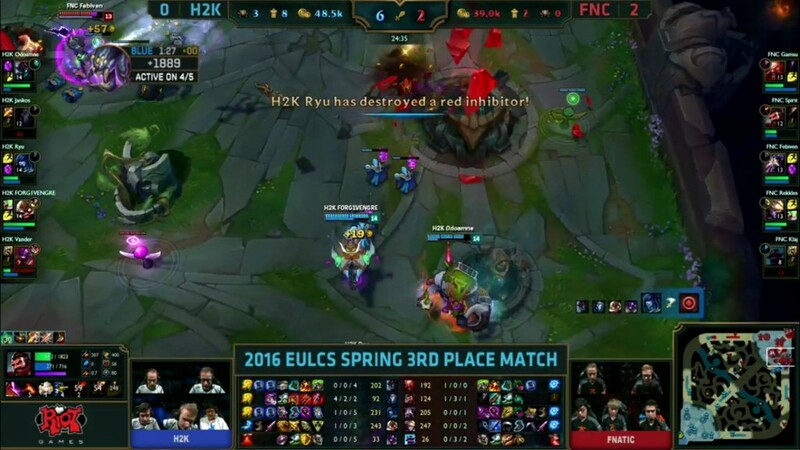 H2K manage to pick off Klaj at the start of that fight and then a beautiful ult by Ryu under turret secures the kill onto Spirit. They push on to grab the inhib turret at 14-minutes! 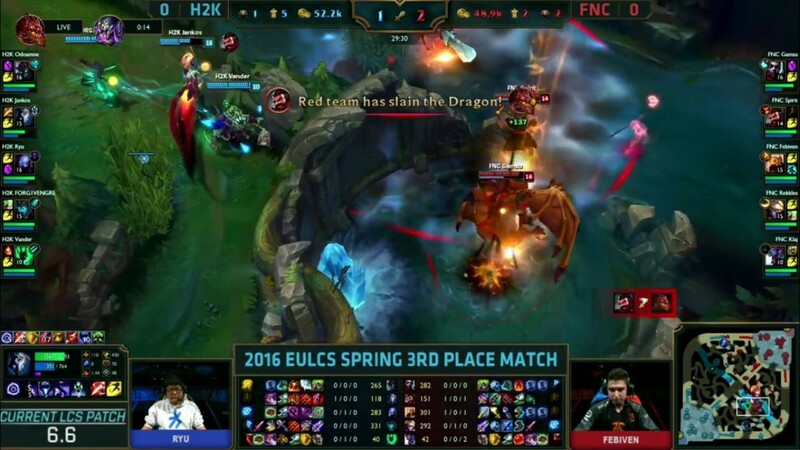 H2K take their second dragon of the game. Nearly 6K gold advantage for H2K. 20 minute update as Baron spawns. 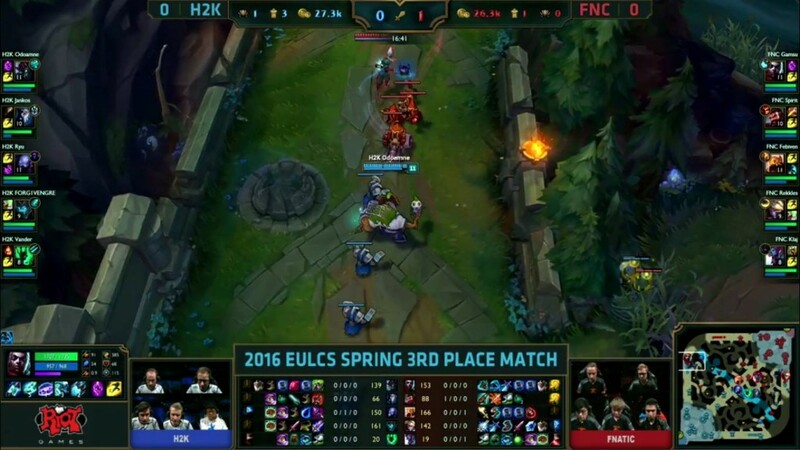 Can H2K bait it out and keep their nerves in a team fight? Spirit is caught out and deleted by Jankos and Ryu. 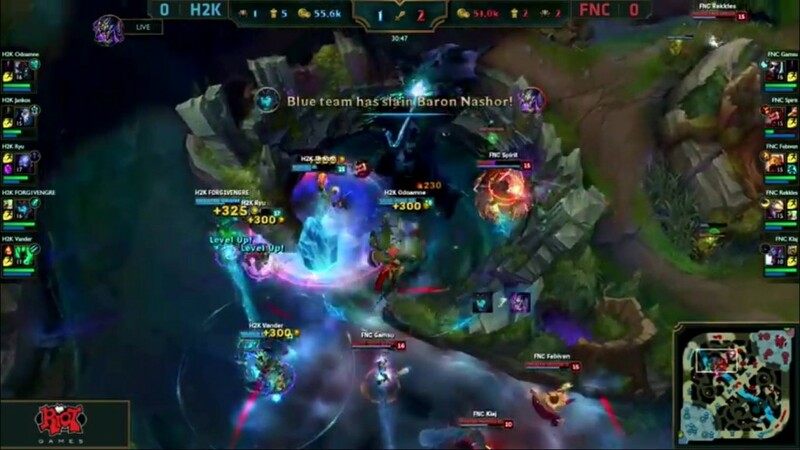 H2K take the inhibitor and go on to take Baron. 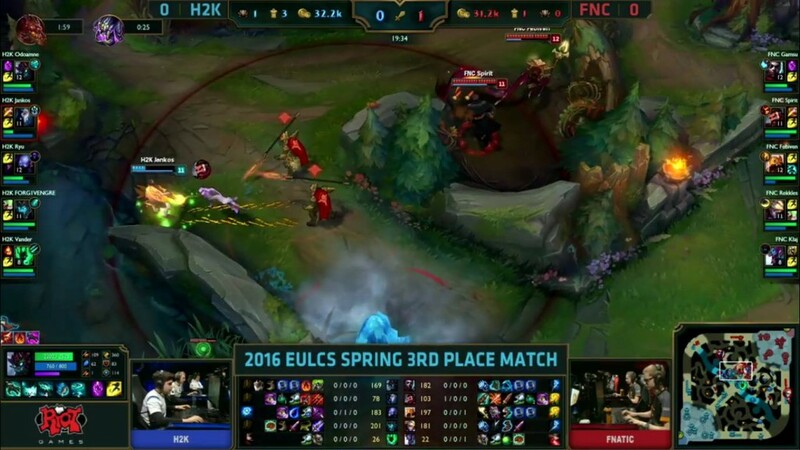 This game is looking beyond reach now for Fnatic, especially with this little to no wave clear. 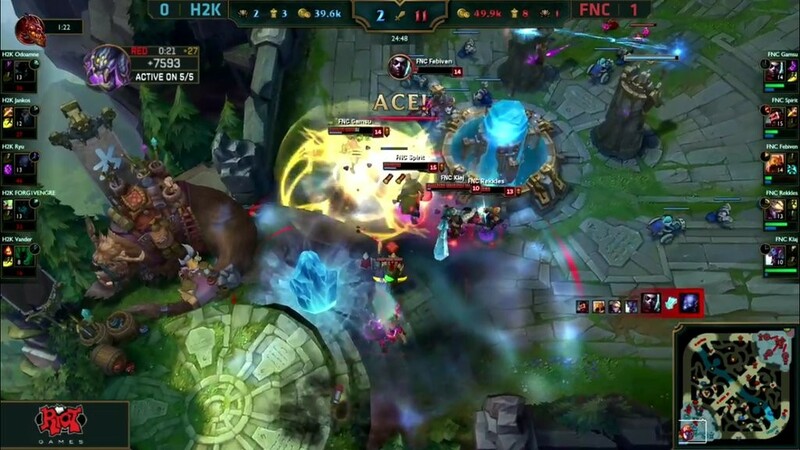 H2K trade 1 for 1 but are able to take down the second inhibitor. 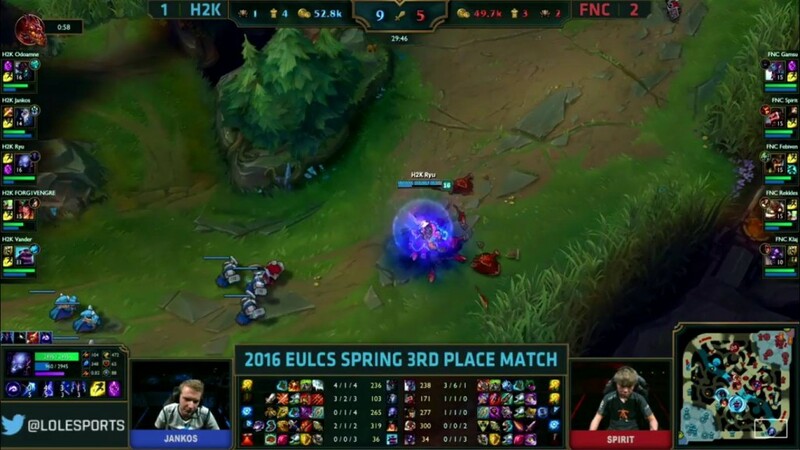 H2K are using their baron buff to try and end, but they’re all low! 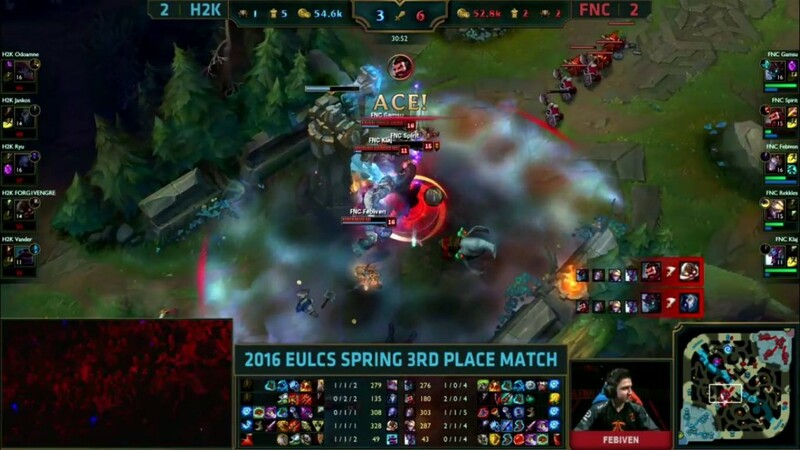 They manage to get the towers but Fnatic ACE H2K! What!? Could this be one of the greatest comebacks ever? Sorry to big it up, but this won’t be the greatest comeback ever. 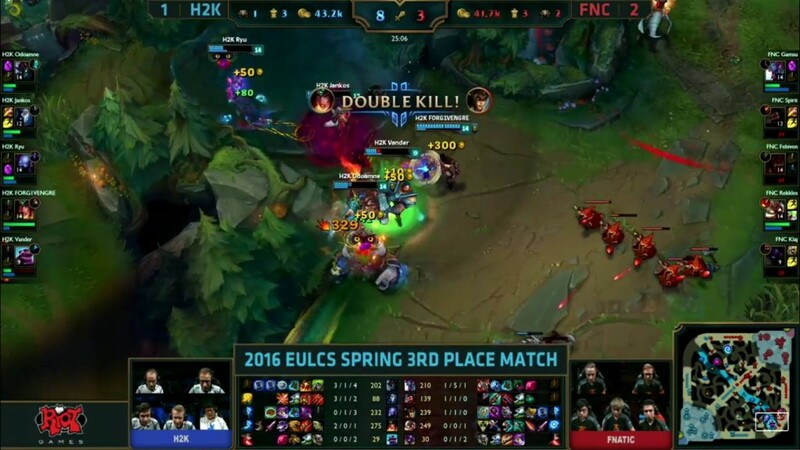 H2K come straight back from that ace by Fnatic and get 3 kills of their own to end the game. 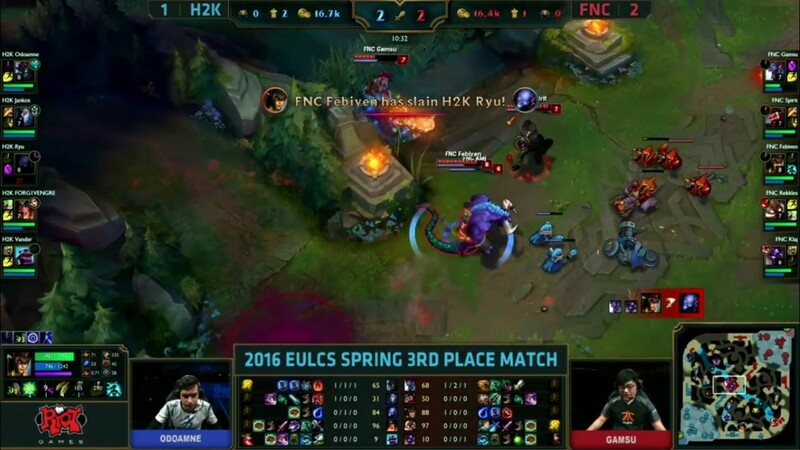 Febiven with the Cass pick in the mid lane to counter Ryu and the Ryze. H2K have a full engage team comp, it’s a team that needs to catch someone. This’ll be a good game. 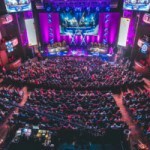 H2K need to win to avoid elimination and a 4th place finish. Another first blood for Jankos! Gamsu is over-extending in the bottom lane and Jankos punishes him with an early gank. Gamsu 1v1’s Odoamne in the bottom lane! Gamsu and Spirit try to catch out Odamne in the bottom lane, but the Maokai is too strong! He catches out Gamsu under turret and manages to secure a kill. 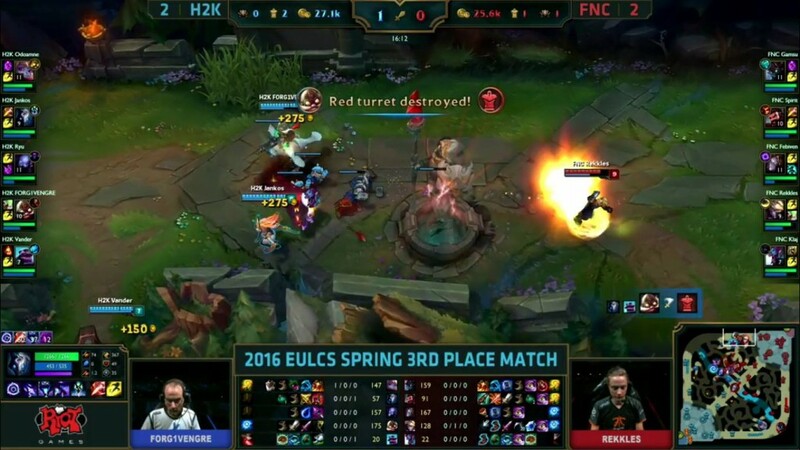 A lot of resources thrown into taking down Ryu, but it’s worth it as Fnatic take mid turret afterwards. 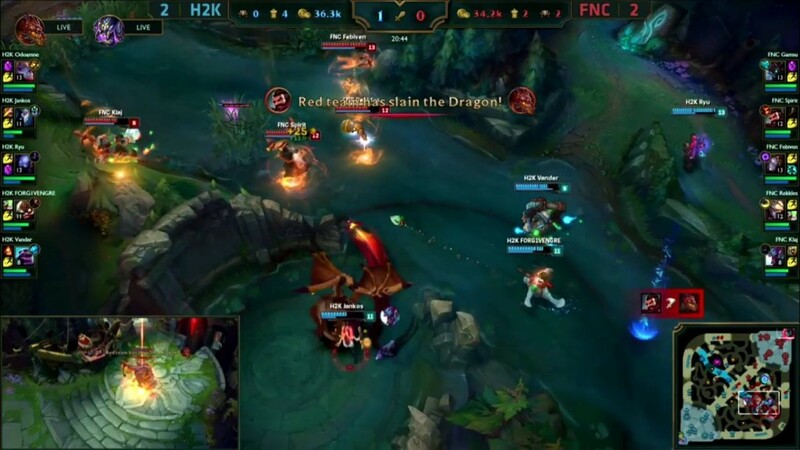 H2K grab the first dragon of the game. They’ve grabbed the first dragon every game in this series. A failed engage by Klaj sees him blow his flash and Rekkles blow his heal. Gamsu gets caught out in the enemies blue side jungle. 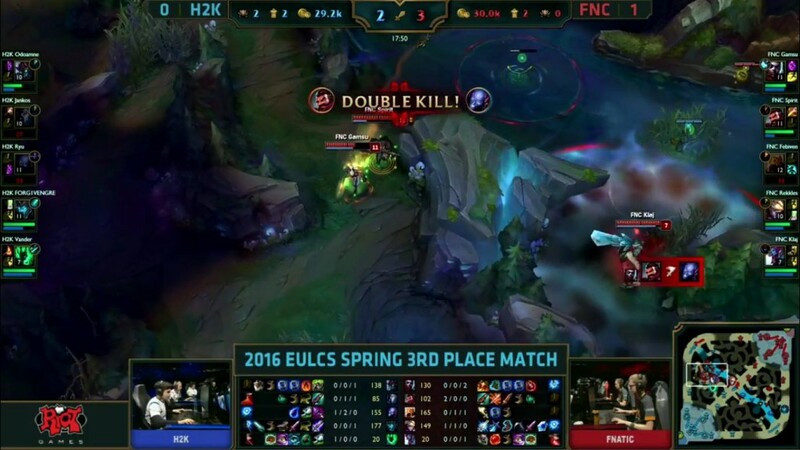 H2K now 3-2 up in kills. Fnatic get Dragon and a kill onto Jankos. 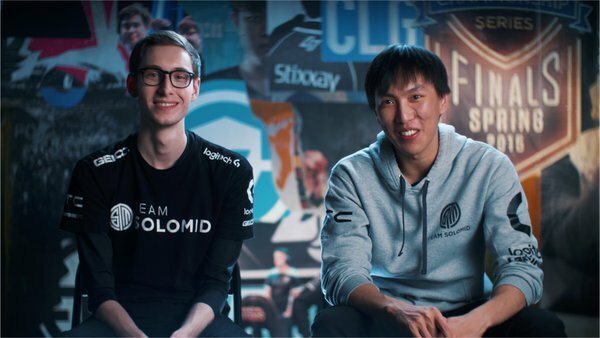 Jankos and Odoamne take down Gamsu in the bot lane. 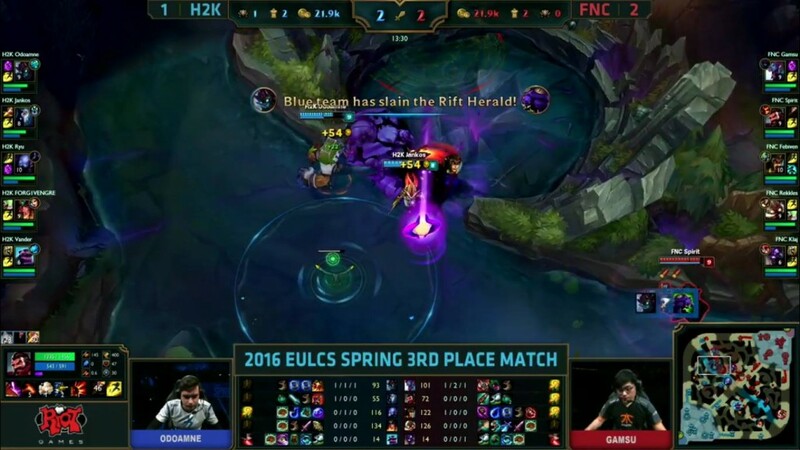 Fnatic try and respond with baron but they get forced off it as they don’t have a tank to tank the damage baron deals. 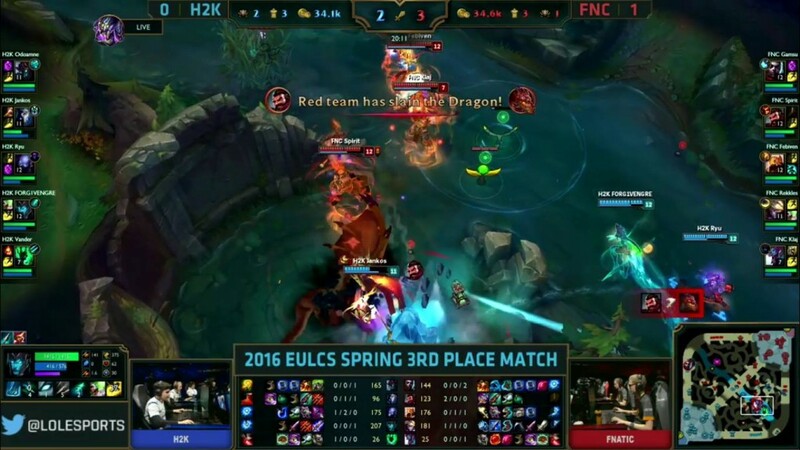 Fnatic get dragon but H2K take out 3 members! 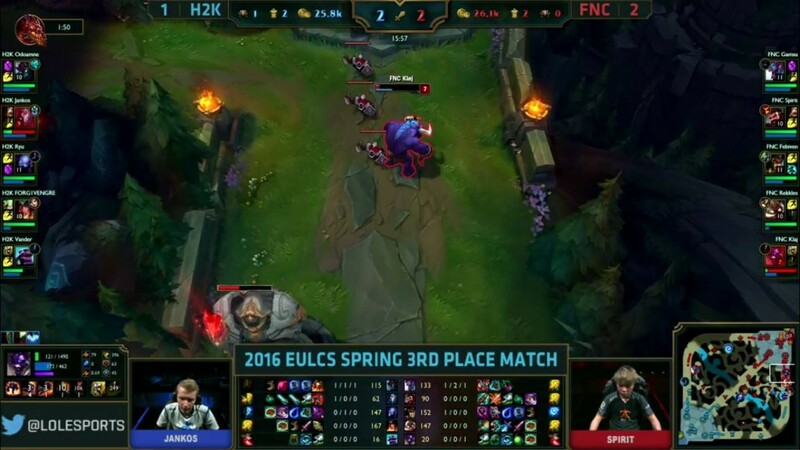 H2K grab Baron for the second game running! 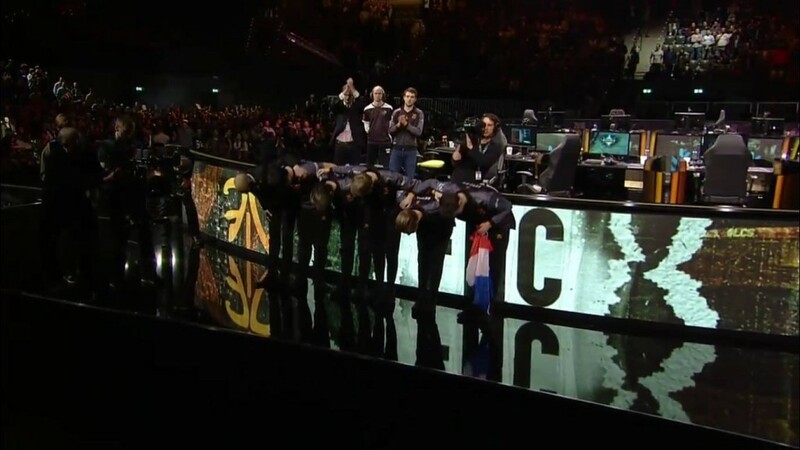 Fnatic take out 2 members afterwards, but there is still 3 members of H2K with the baron buff on them! 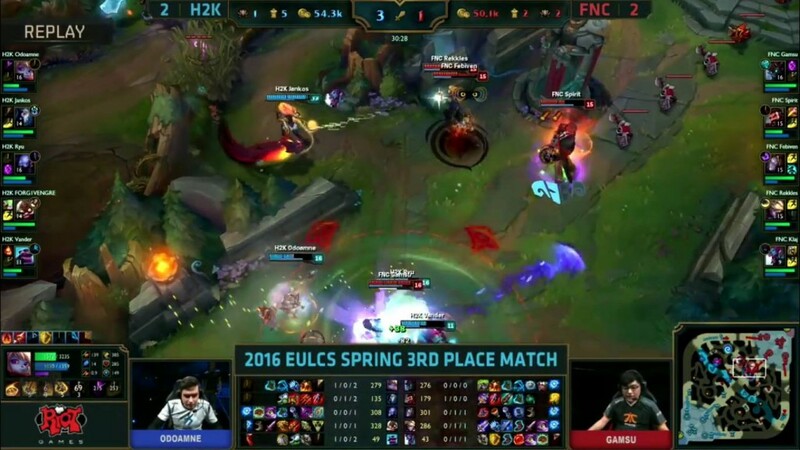 H2K 3K gold up on Fnatic. 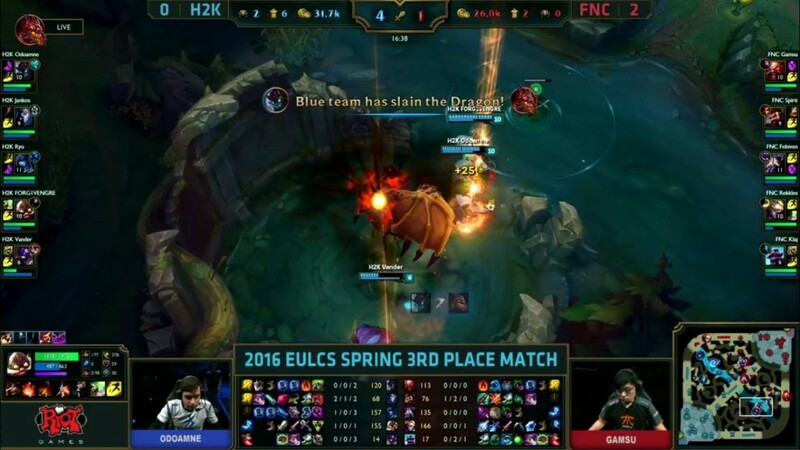 H2K grab dragon and then kill 4 of Fnatic, only losing their support in the process! They push top and kill Spirit to grab the ace and push in to win. 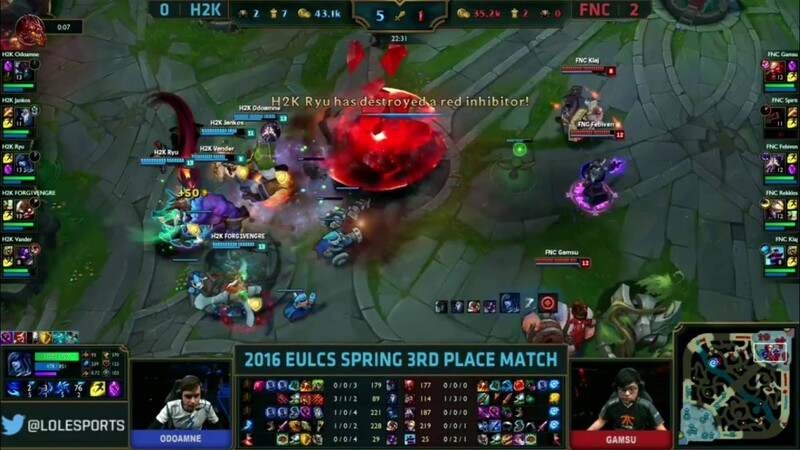 H2K TAKE IT TO GAME 5! You’ve gotta love Game 5’s. Winner takes all. The drama. The tension. 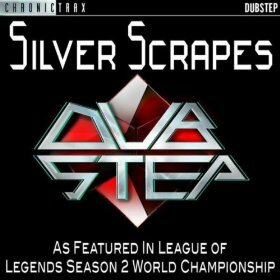 Oh, and Silver Scrapes. 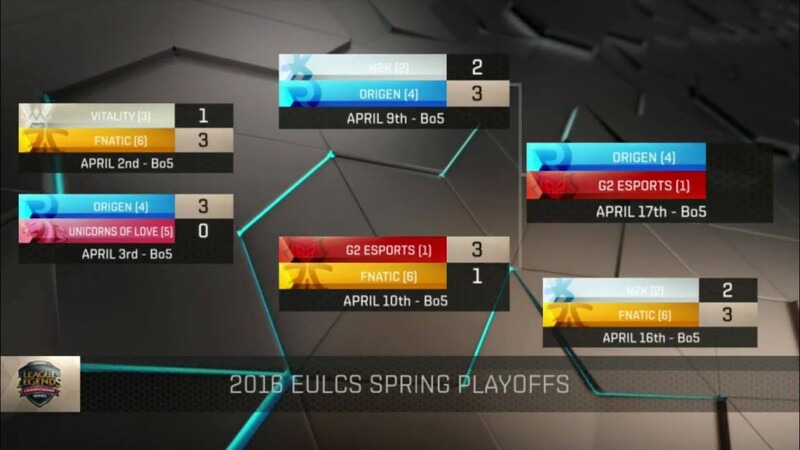 This is how the picks and bans look going into the final game of the EU LCS. Who will gain those valuable Championship Points? Spirit steals Jankos’ red – huge early game move. A farming frenzy across the map here, no sides really making moves. Forgiven up in CS over Rekkles. 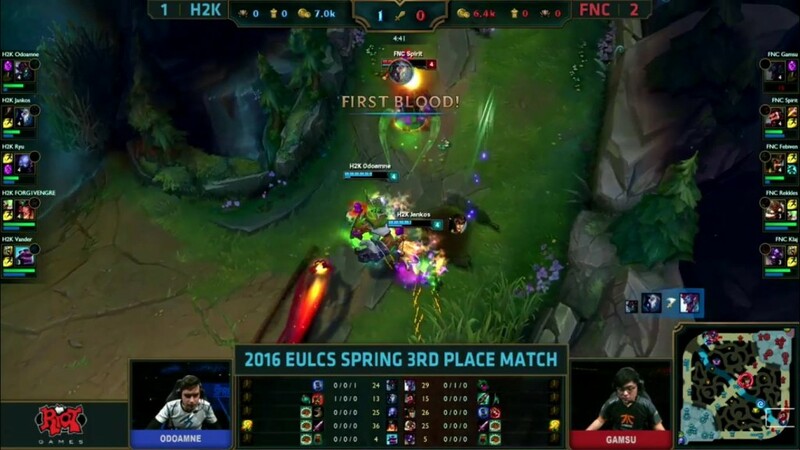 First blood to Odoamne and H2K after a successful tower dive onto Rekkles! Spirit steals Jankos’ red buff, again. Poor Jankos. H2K even up the tower kills. 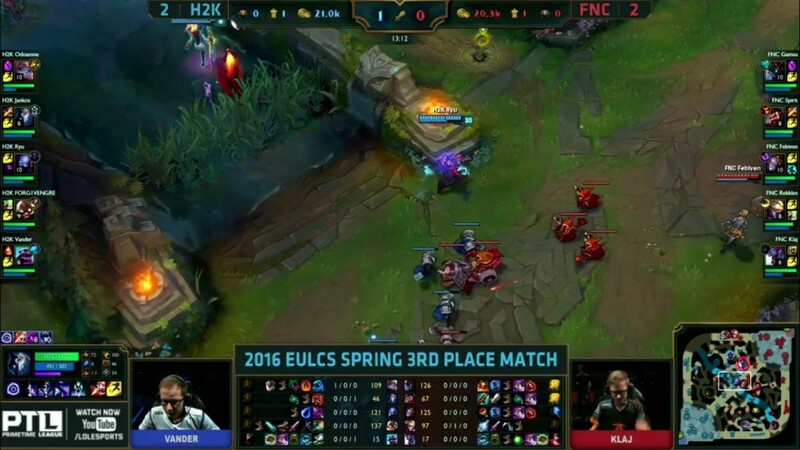 H2K have a slender 0.2k gold lead. H2K grab Rift Herald. Rekkles is now 30 CS down to Forgiven. 13 minutes gone and it is a nervy game. Neither team wants to be the one that makes a mistake and you can tell that by the lack of action. Fnatic take the first dragon uncontested, the first time they’ve took the first dragon this series. 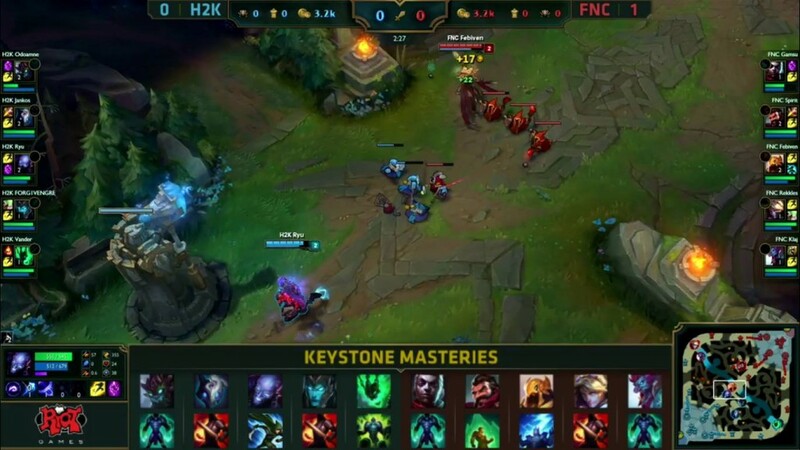 Forgivens pressure top means that H2K can get a tower for free. The CS lead is now nearly 50! Corki already has his triforce. 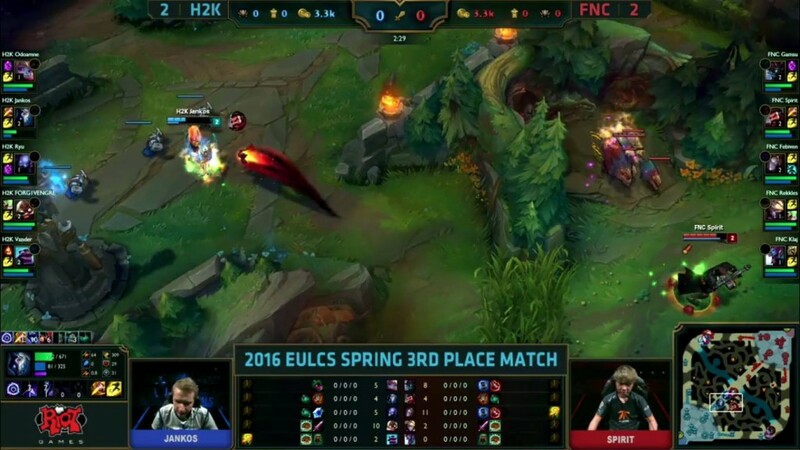 H2K are playing the split-push game brilliantly. 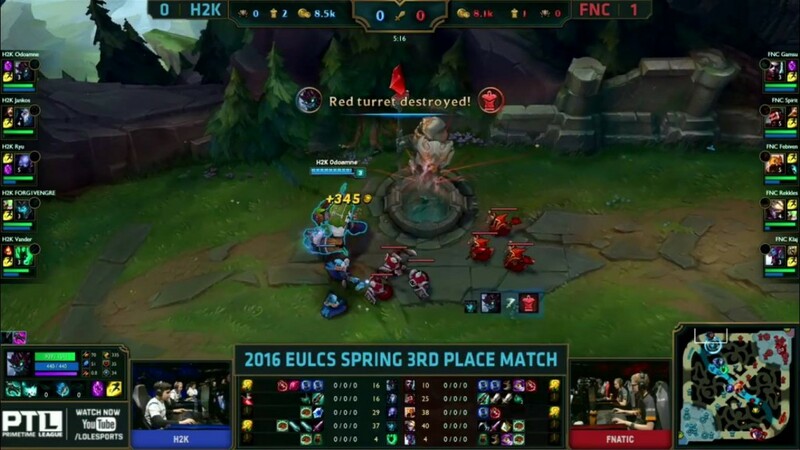 FNC take a turret top, but H2K’s Forgiven pushes bot and manages to get 2 turrets. 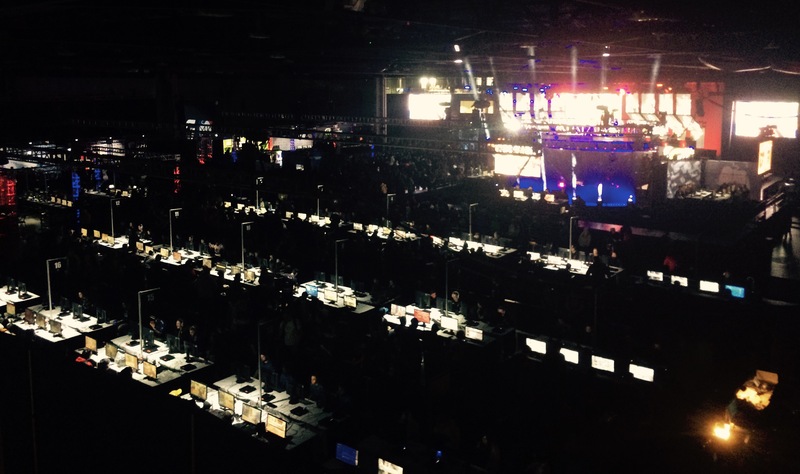 They’ve now got a 2K gold advantage. 4 towers to 2. Spirit steals Dragon from H2k! But the fight that ensues after goes in favour of the team that was 2-0 down. 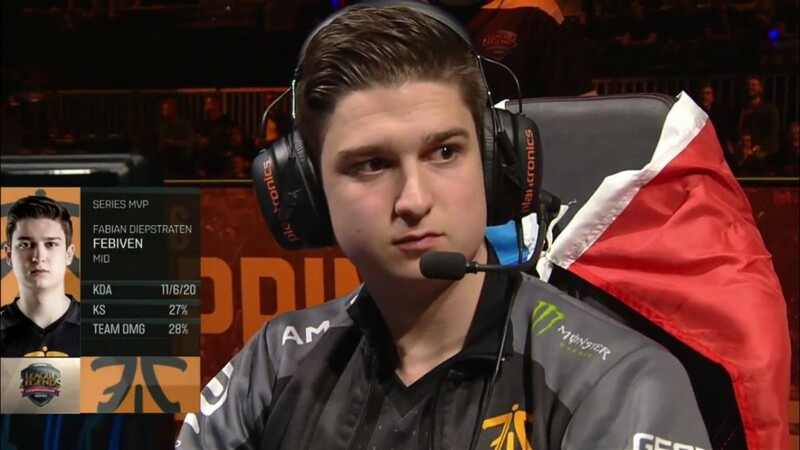 FNC’s front line gets shredded and Febiven drops far too quick. H2K grab 2 kills and grab mid tower. H2K 3K gold up right now. 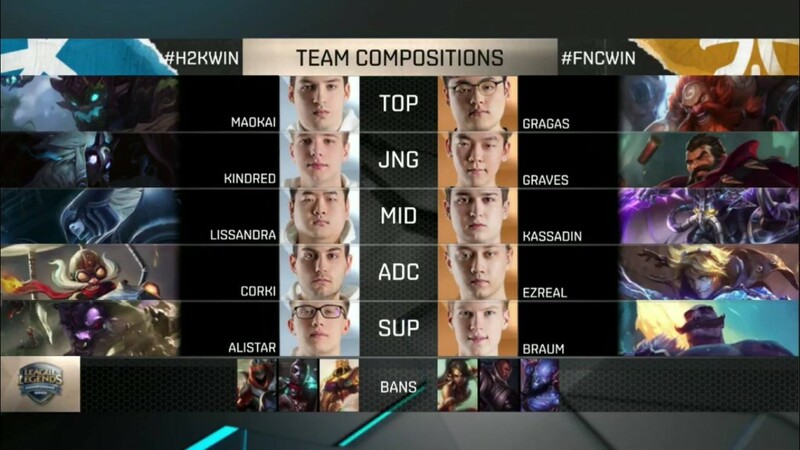 Both teams are just fighting over ward coverage at the moment, H2K looking to take or bait the baron. 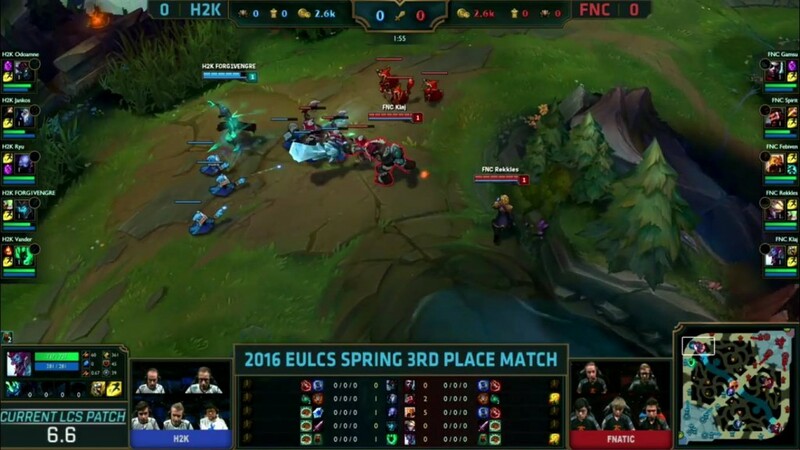 H2K trying to squeeze ever last advantage they can get until dragon comes up in 20 seconds time. 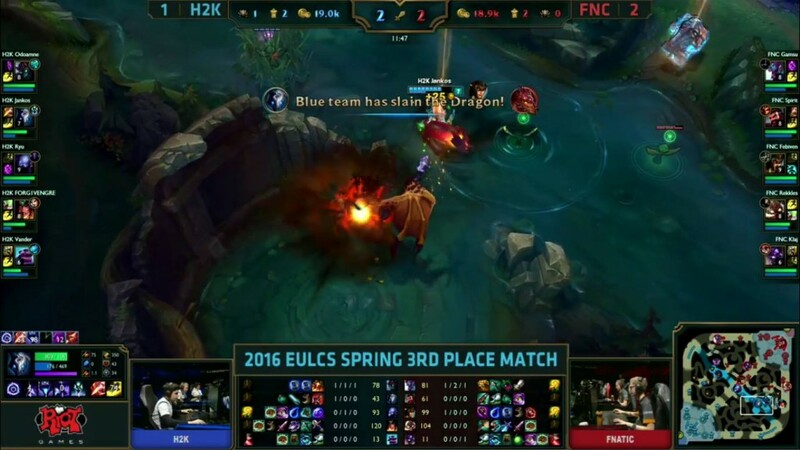 H2K take their first dragon of the game. 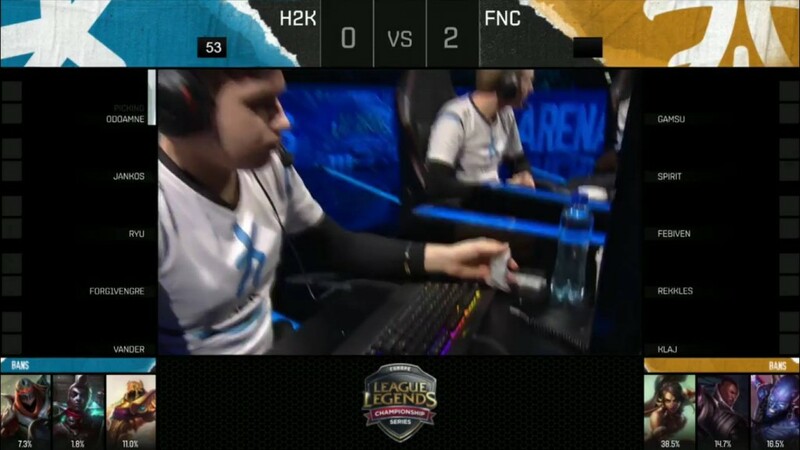 H2K no! What!? What are they doing! 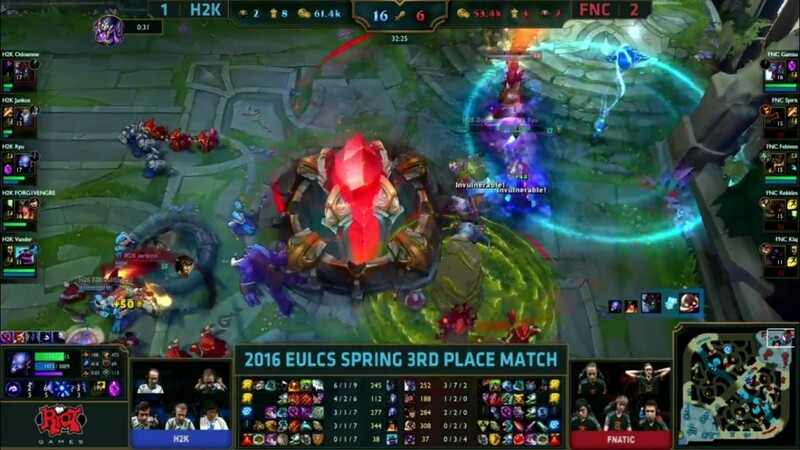 H2K have been in control the whole game, they have FNC on the end of their string, moving them around the map – Fnatic were so reactionary! 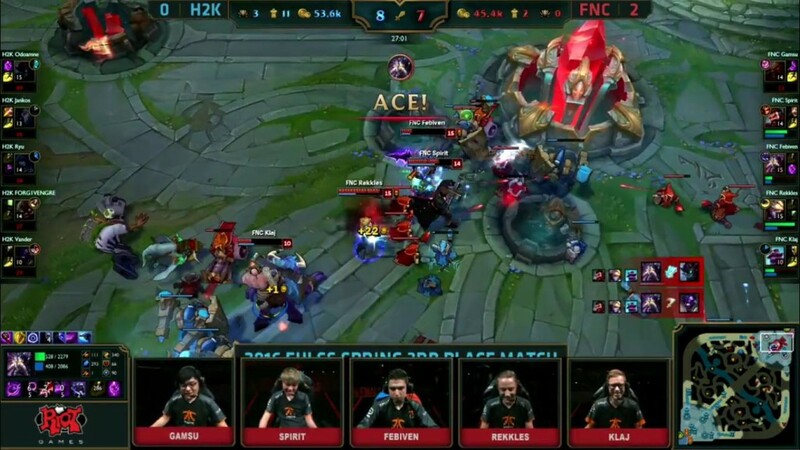 But H2K force an engage, they chase and chase Fnatic under the mid turret, even when low, and Fnatic are able to take advantage of it. 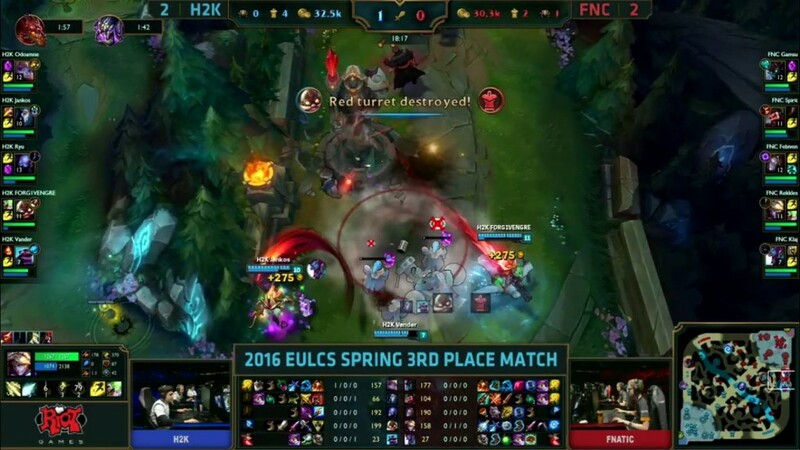 Fnatic turn and they demolish H2K. It’s an ACE and Fnatic push on to win! Unbelievable. 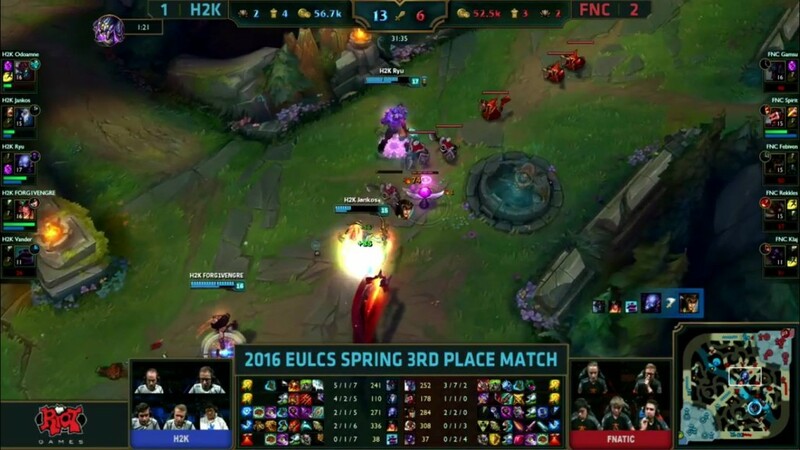 The fight that gave Fnatic 3rd place. 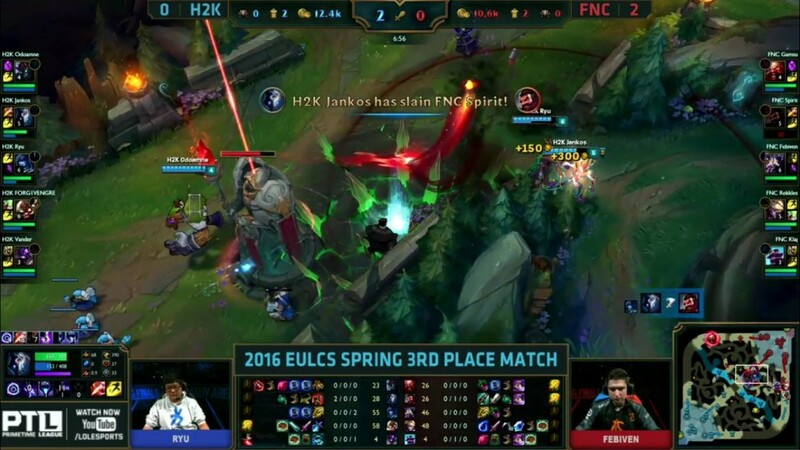 Look how scattered H2K are, with Jankos off to the side. 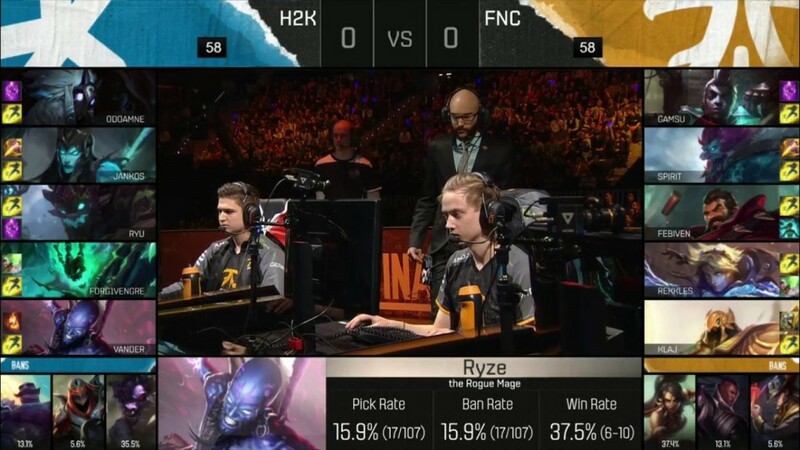 Poppy and Vander were also half health when Fnatic decided to engage. 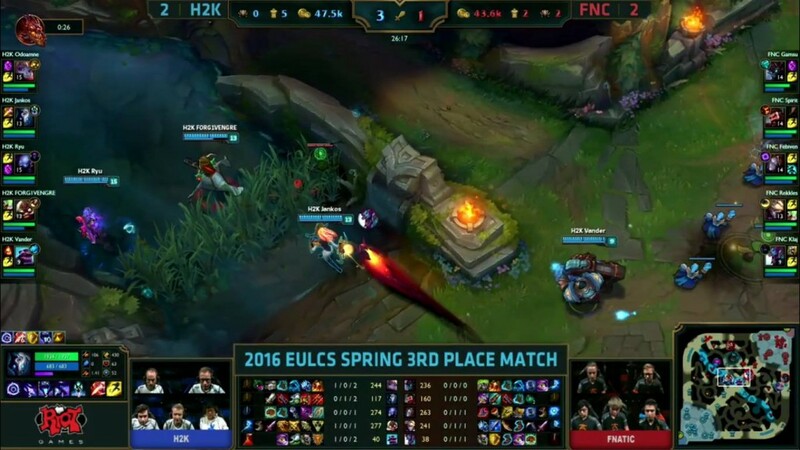 H2K had a 4K gold lead at the time. Febiven – especially for those first 2 games. 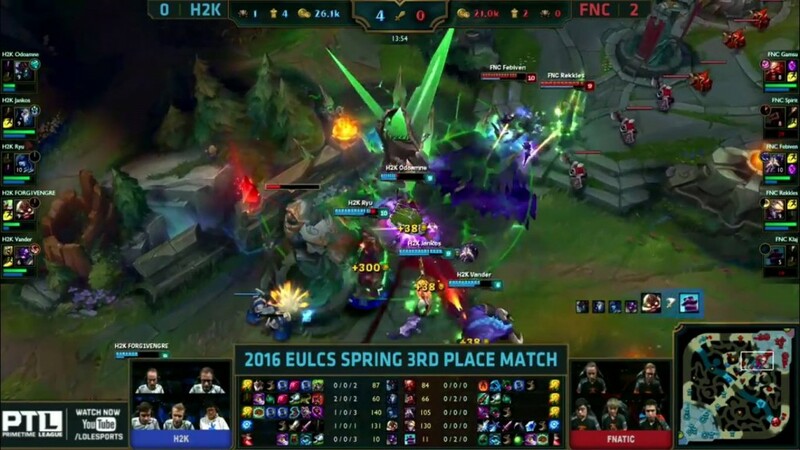 Fnatics mid laner came up big in his hometown. 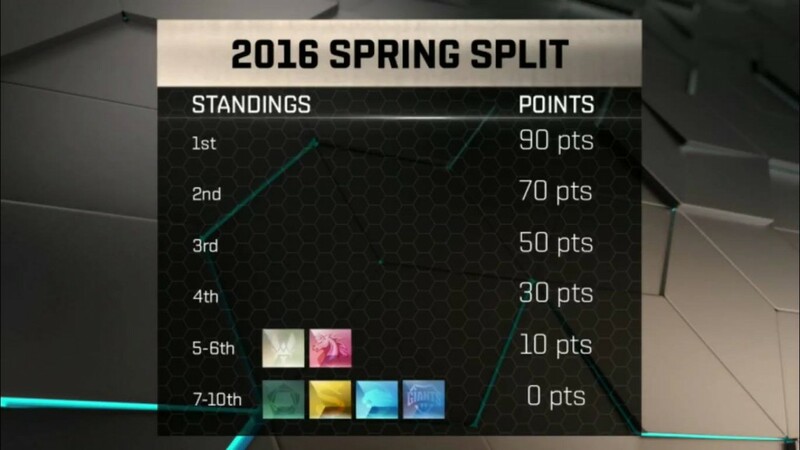 A table of how the Spring Split standings look before the final tomorrow between Origen and G2.